It was still raining when we arrived in Kraków. 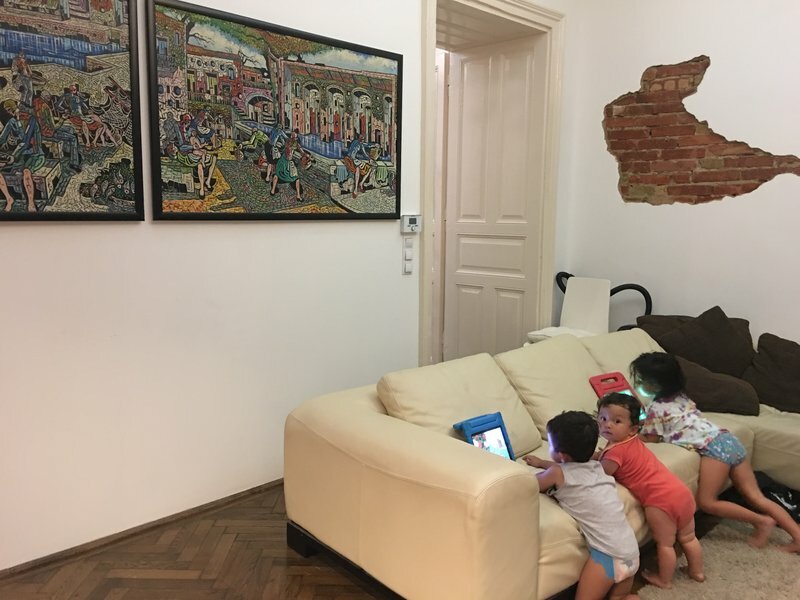 Our Airbnb was a cozy place on Dietla, a wide boulevard that coursed directly between the two old neighborhoods of Stare Miasto and Kazimierz. 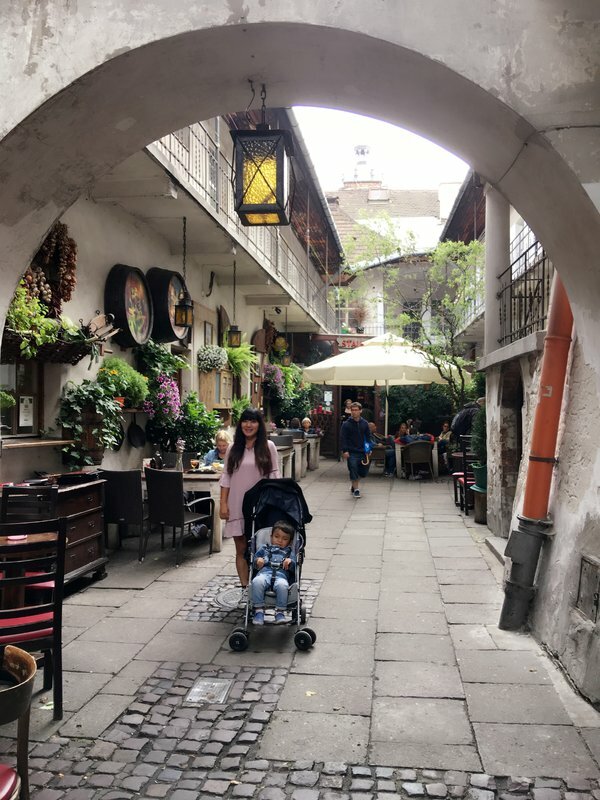 After dropping our bags, we hurriedly consulted TripAdvisor and soon found ourselves hunting for parking in the central square of Kazimierz, the old Jewish Quarter. We wedged ourselves in eventually but our targeted restaurant was booked up. 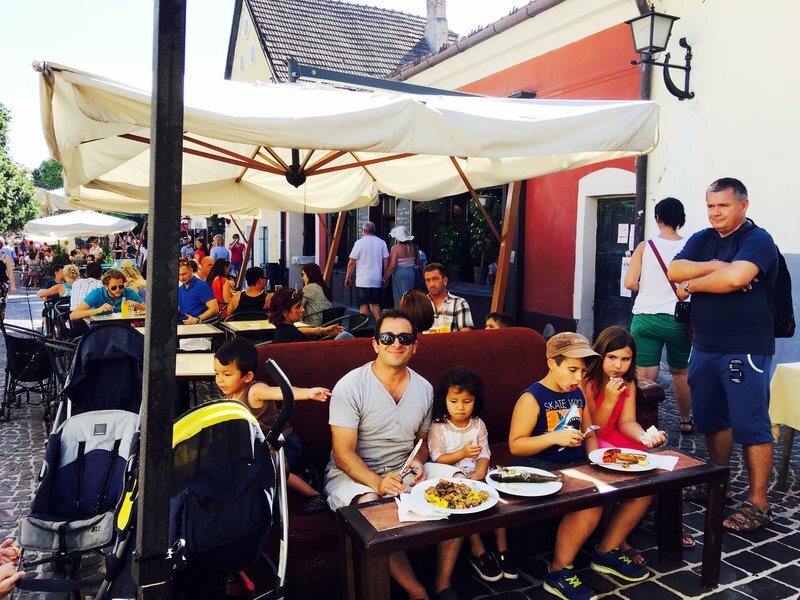 We made a reservation for the next night and discovered an outdoor grill in the square. We consulted the friendly proprietor about where we should eat and he directed us to the restaurant immediately behind him with which he was affiliated. We got to enjoy a restaurant dinner as well as meat hot off the outdoor grill. 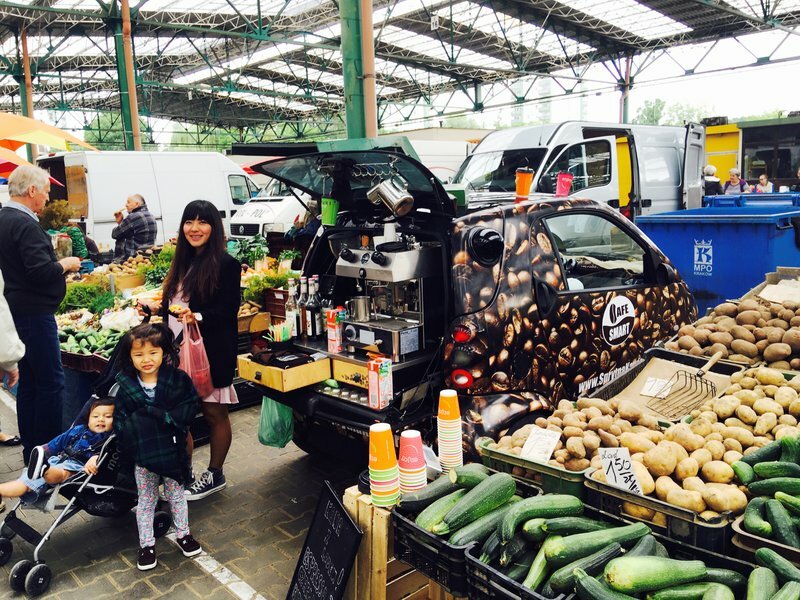 Thursday morning we made a beeline for the largest market in Kraków, Plac Imbramowski. This warehouse-like produce market is far from the touristic center and is a very local scene. Vendors were exceptionally friendly, which we found to be typical of the Krakovians in general. Some of the highlights were a coffee shop operating out of the back of a Smart Car, complete heads of sunflower seeds, and enormous bags of puffed corn. 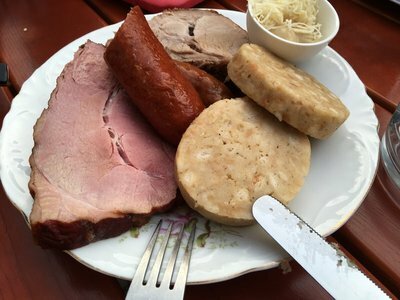 We had a typical Polish lunch at a cafeteria-style restaurant adjacent to the market before heading back to the center to explore the old neighborhoods. 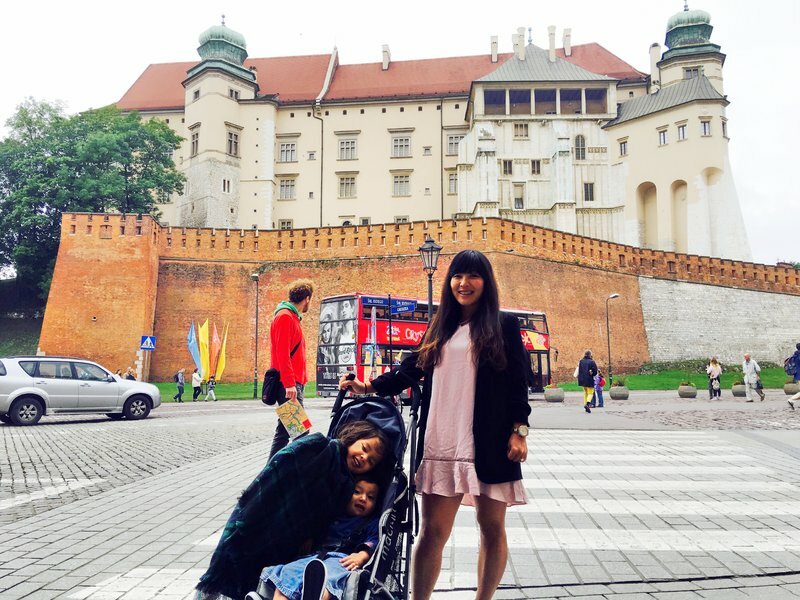 Wawel Castle is the defining landmark of Kraków, nestled between a sharp bend of the River Vistula and Stare Miasto old town. 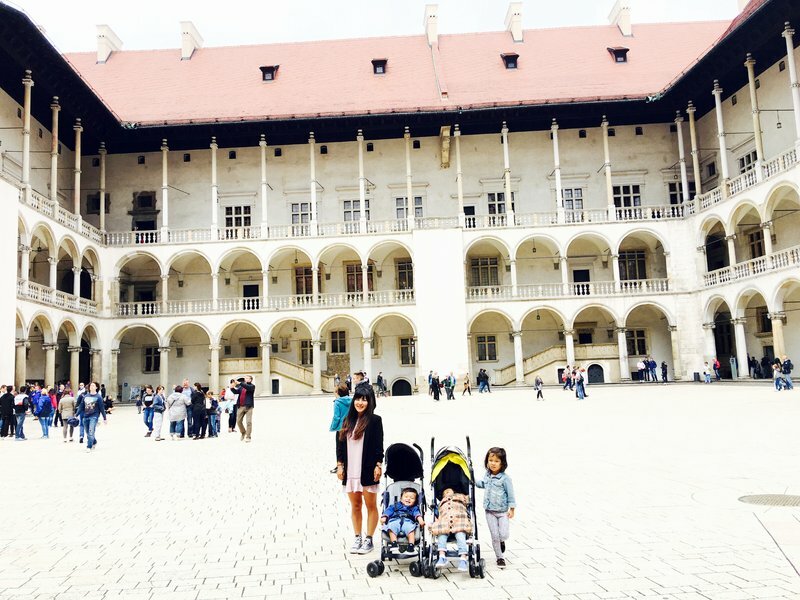 We took the winding path up Wawel Hill to the Castle but as usual decided against any of the guided tours. The exteriors of the castle and the cathedral within gave us plenty to marvel at. 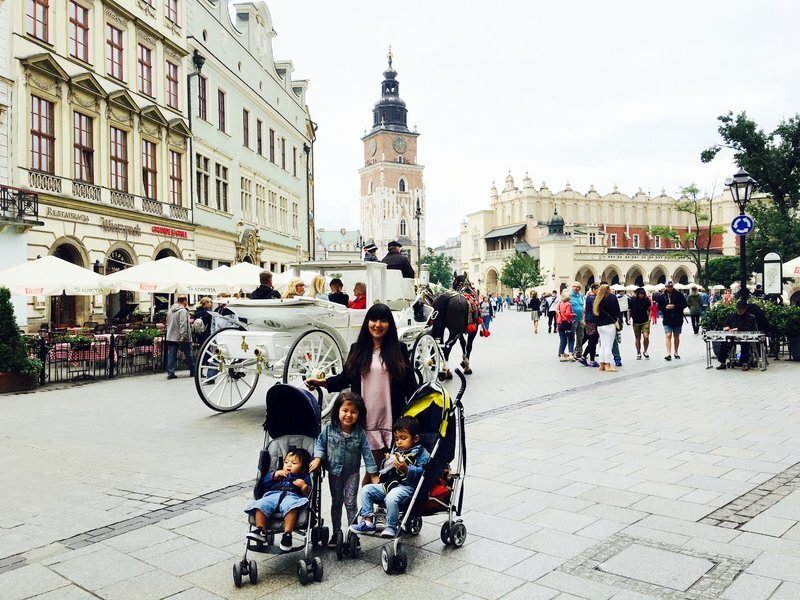 Stare Miasto is definitely the place to hang out for tourists in Kraków. There were so many people there, I found myself wondering where they came from and what kind of trips they were on. 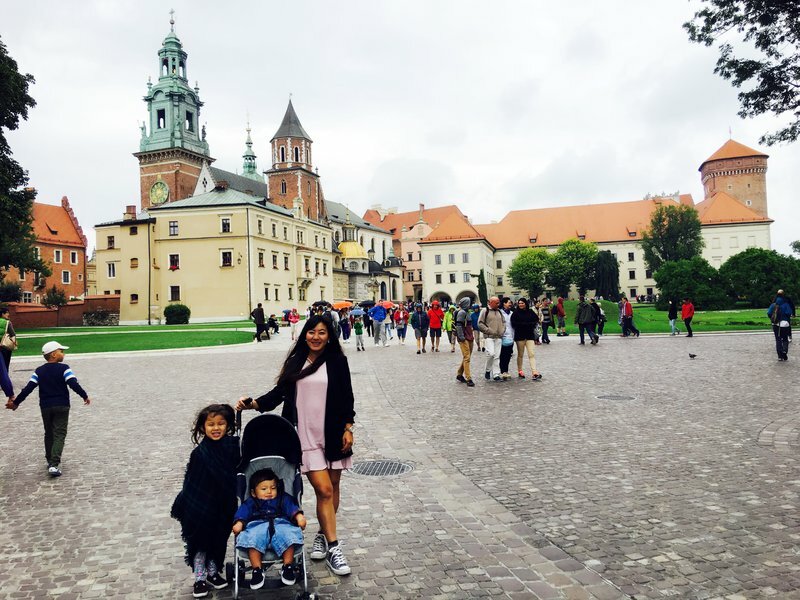 Kraków is hundreds of miles from the well-known tourist cities of Berlin, Prague, Vienna, and Budapest. Were people flying here from other countries just to visit Kraków, or were they mostly coming by train? I doubted there were many people on long road trips like us. I also didn't think there were many Americans there, because Kraków is largely unknown to us compared to the cities I mentioned before. I was very glad I'd made the decision to extend the road trip all the way here because the city was truly unique and beautiful, even though I'd heard so little about it before. 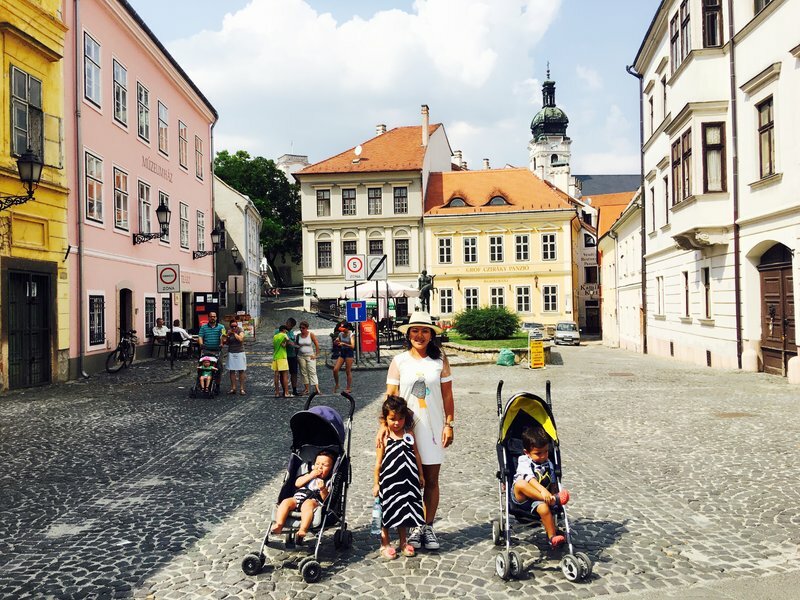 The old town was immaculately clean despite the presence of horse-drawn carriages everywhere. 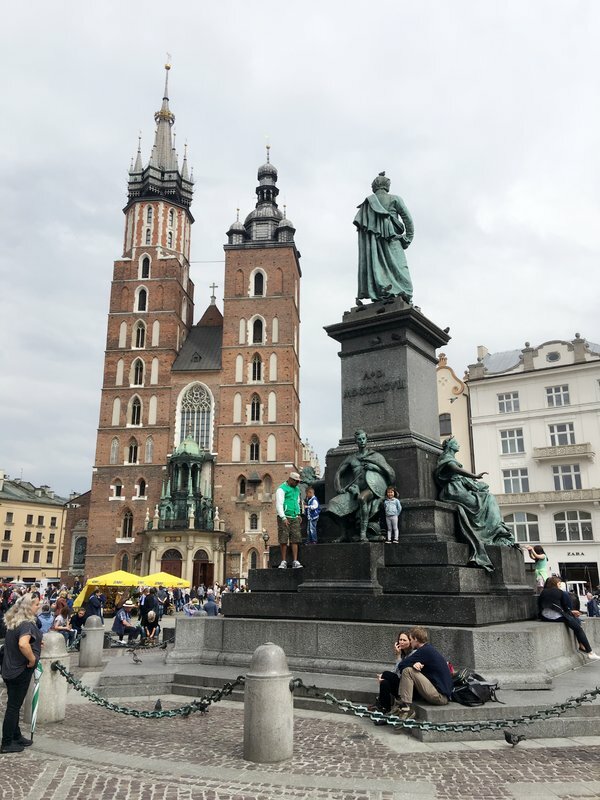 At the heart of the old town are the open plaza Rynek Główny and the 14th century St. Mary's Basilica. The plaza was filled with vendors selling grilled meat, pierogis, and souvenirs. 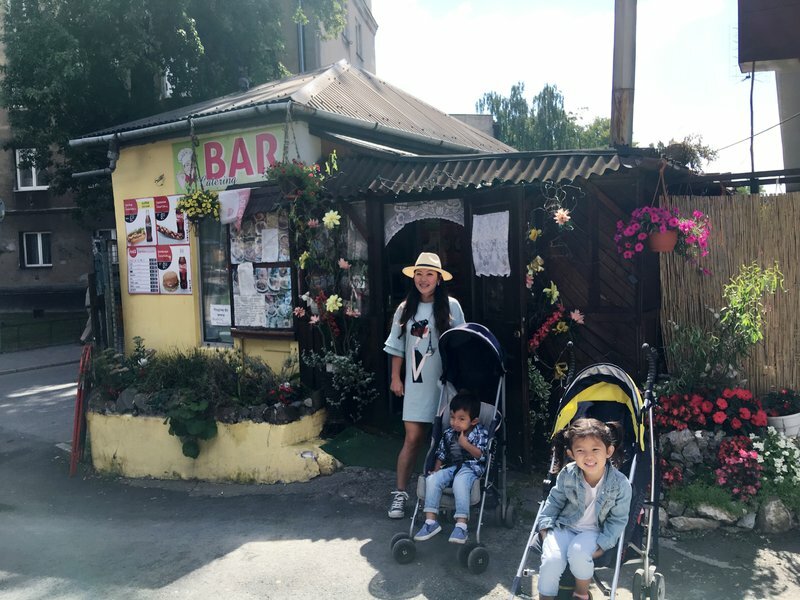 We had some time before dinner so we walked over to Kazimierz, which had a more Bohemian, lived-in feel than Stare Miasto. 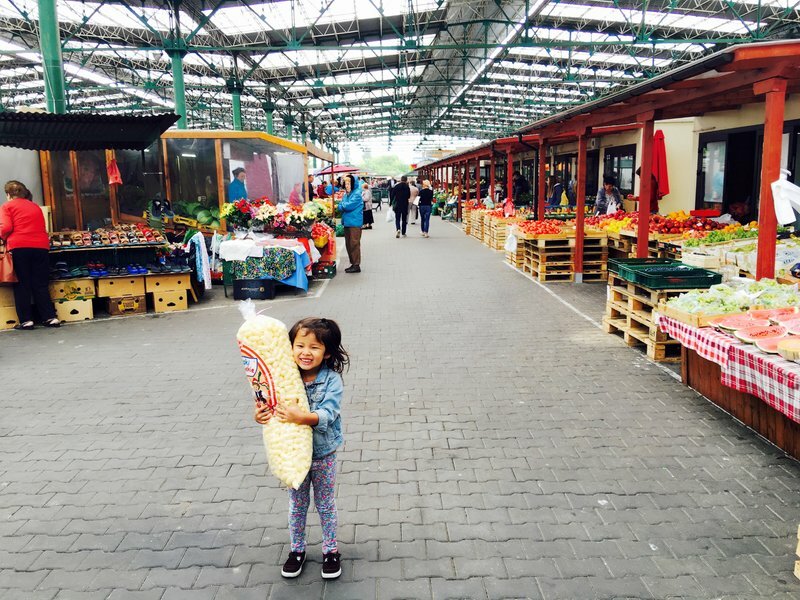 The remnants of the daily market at Plac Nowy were making their last sales. 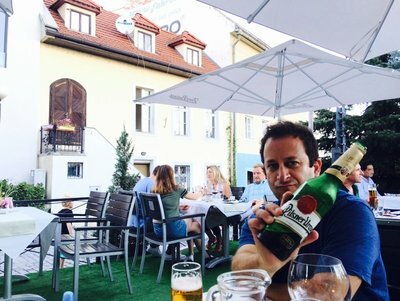 Dinner in the popular restaurant in Kazimierz where we had reserved a table ended up being nothing special, but it's always good to try a new country's local lager. 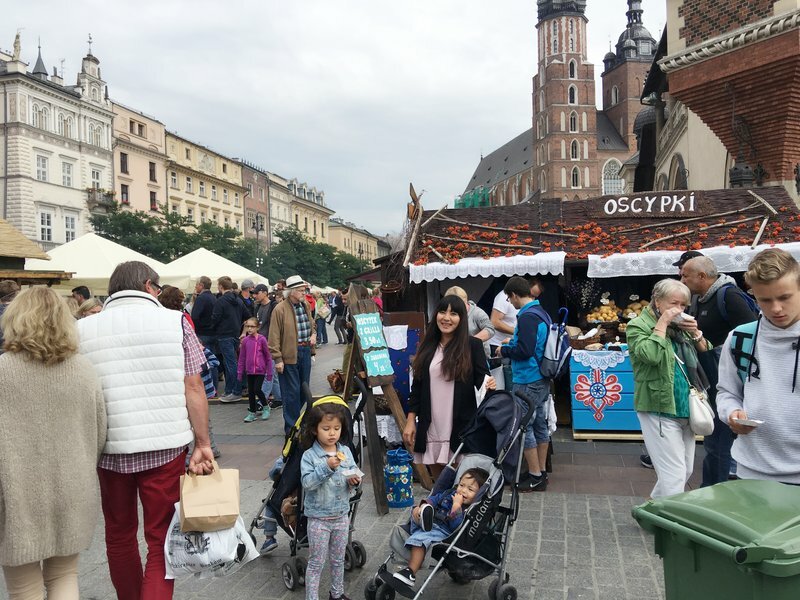 Friday we decided to visit as many markets as we could in central Krakow before leaving for Czech. 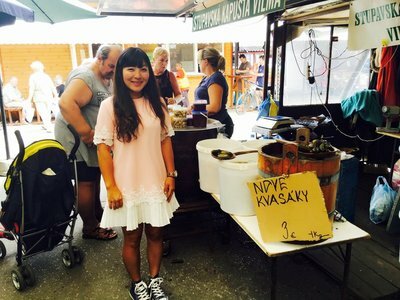 First up was Hala Targowa, a gritty outdoor market just east of the old town with good produce and a tiny little restaurant in the back. On the way back through the old town we encountered the annual pierogi festival where every conceivable variety of the little bland dumpling was being made and sold. At one booth Mei Ling and the kids got a pierogi cooking lesson. It was fun, but I think I'll stick with dim sum. 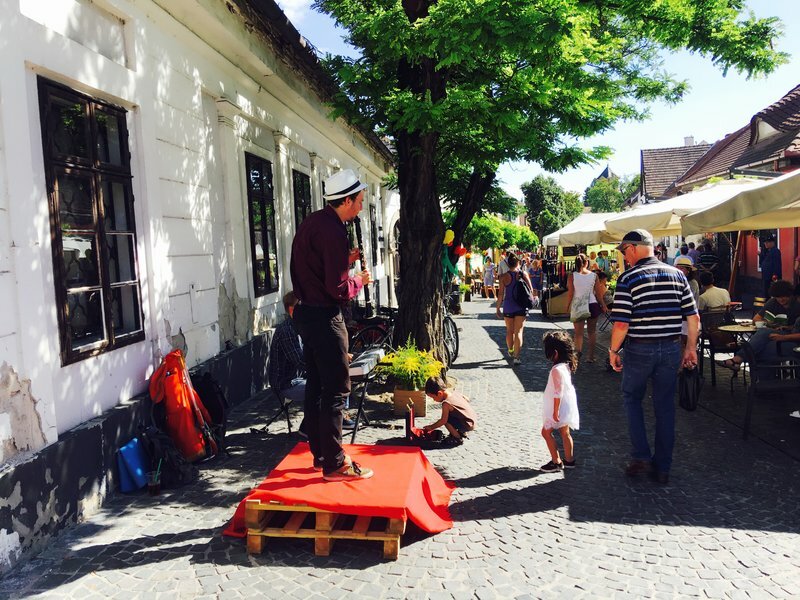 The last two markets were Nowy Kleparz and Stary Kleparz, slightly north of the old town. These were both good-sized markets and each had their individual character and specialties. 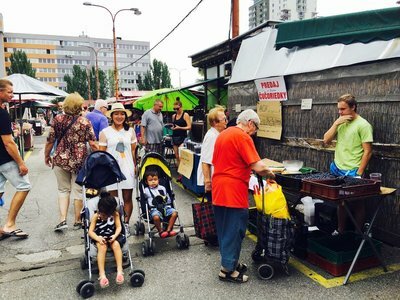 I can't remember if we've ever been able to walk to three separate farmer's markets in one city before. We could have made it four if we had decided to go to Plac Nowy in Kazimierz as well, but we had already been there at the end of the previous day. 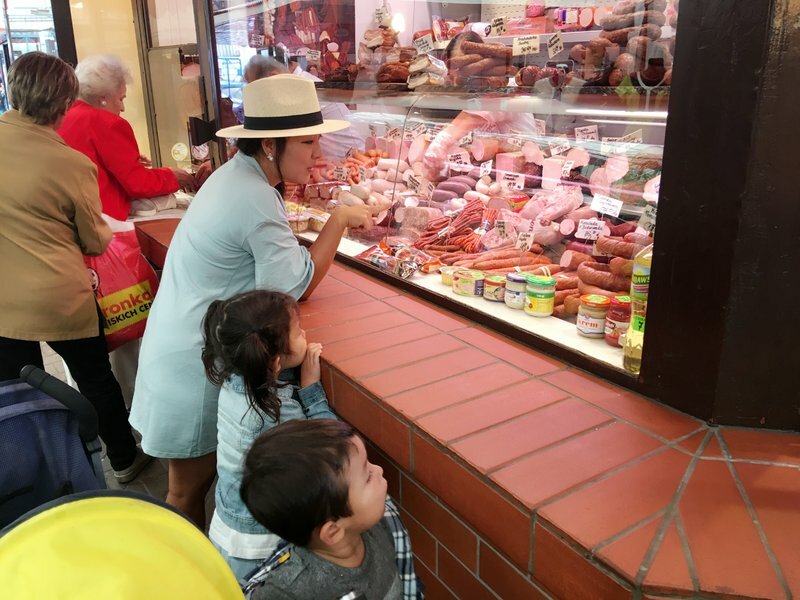 None of the individual markets was quite as much fun as Trhovisko Miletičova in Bratislava, but with all the venues together we concluded that Kraków was one of the better market cities we had visited. 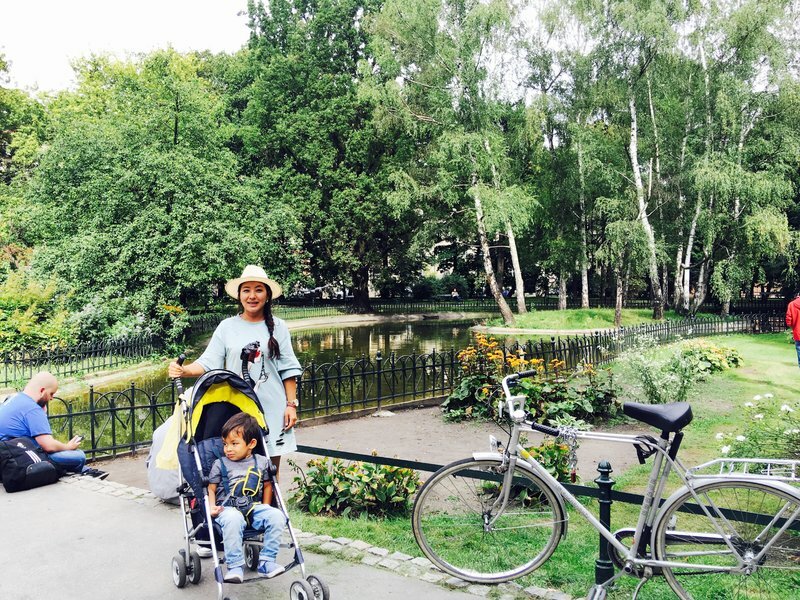 We spent another hour or so in Kraków having lunch and checking out the interesting strip of park called Planty that surrounds the old town. 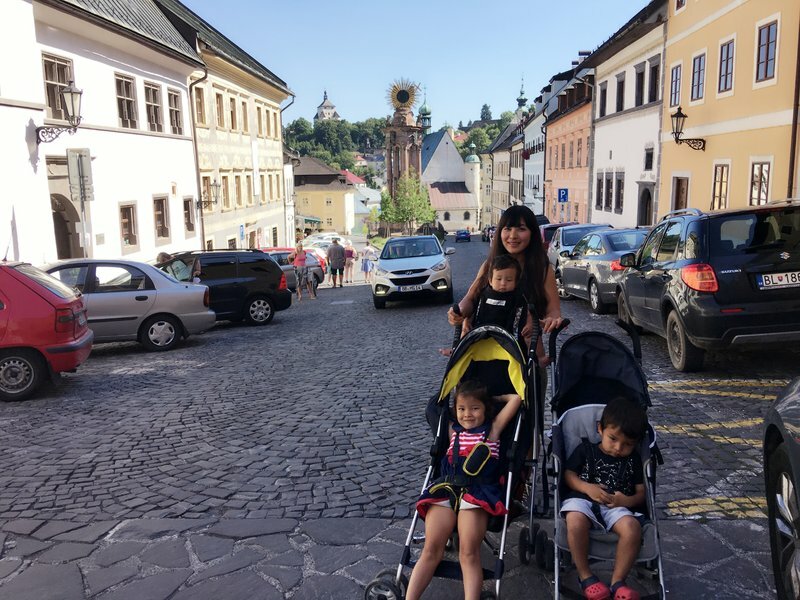 After a two-day stay that passed far too quickly, it was time to move on to the Czech Republic, the last country of our road trip. 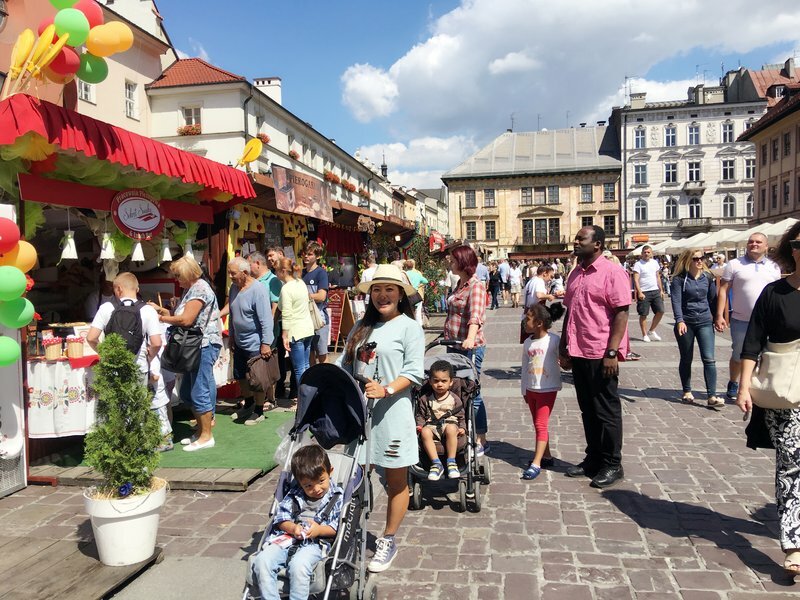 For more on Kraków, here are links to a great summary of ways to spend time in the city and to a list of the markets with good descriptions. I had chosen an unusual stop for the first night of our return to Slovakia. It was either a farm, or a B&B, or a retreat. I couldn't quite tell. But there was a pool, and animals, and I hoped it would be fun for the kids. 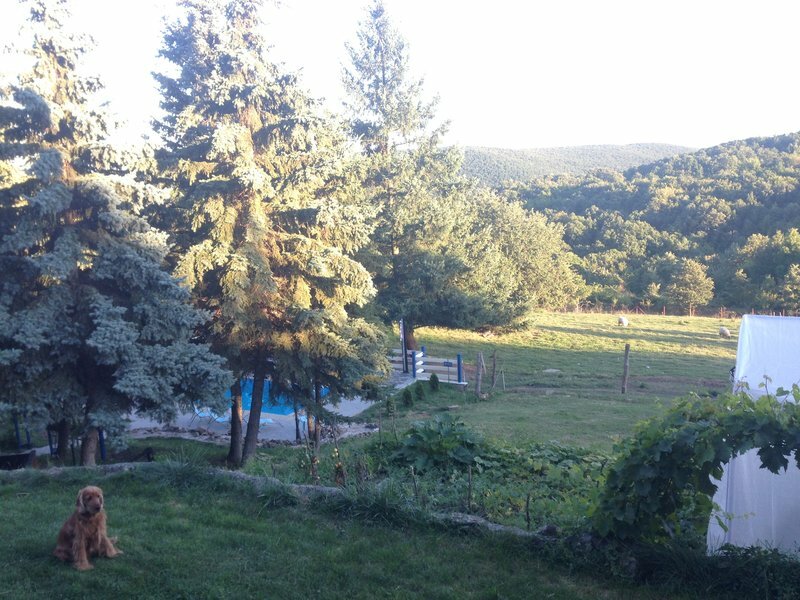 The farm was just over the border from Hungary, close to the tiny village of Hrušov. We had some trouble finding it, so our host Jan instructed us to drive into town and immediately found us there. He led us about a mile down a bumpy dirt road to the farm, which was set on a grassy hillside with no other sign of civilization in sight. Jan had designed and built the farm himself just a short while earlier and we were among the first guests. Our villa was beautiful and modern, and there were fruits and plants growing everywhere. 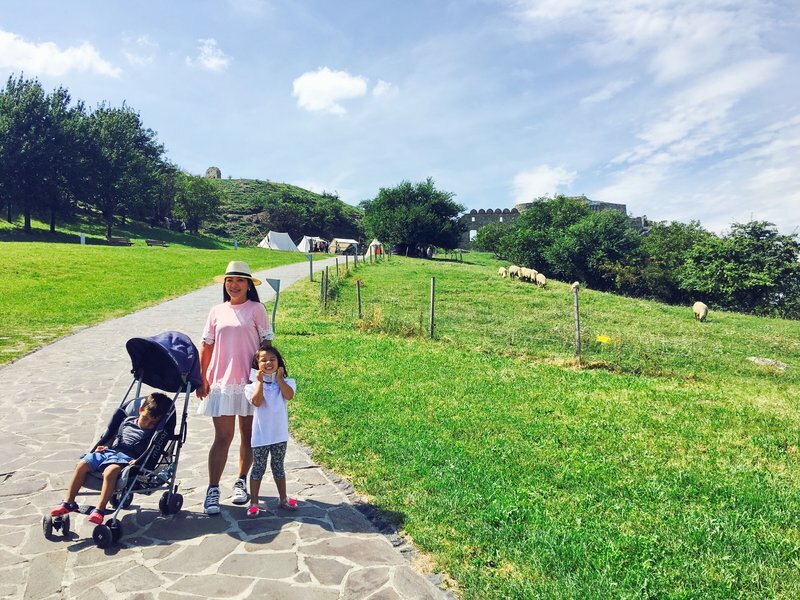 There was a very modern pool, a sauna, a little playground, and lots of pets and farm animals for the kids to feed and play with. 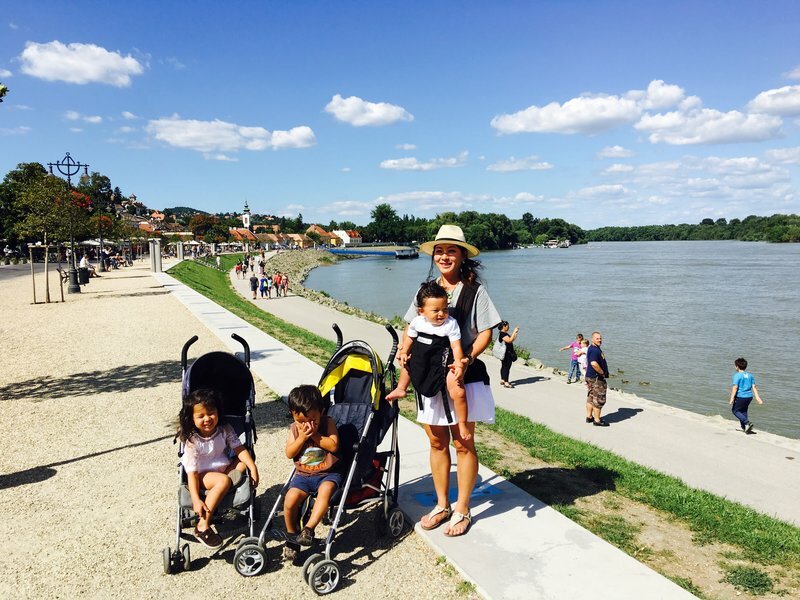 It was a tiny paradise in the middle of rural Slovakia. Jan lived there with his girlfriend and the two of them worked tirelessly around the clock to manage the plants and animals, as well as cater to their guests and socialize. I have no idea how they did it. Our only mistake was in not loading up on food before we arrived. There was only a pizza restaurant in the village and they weren't delivering. 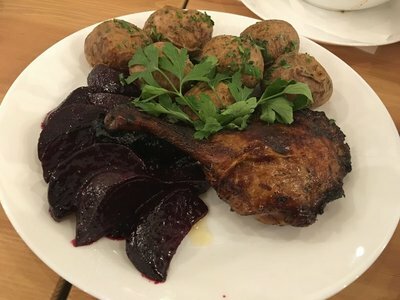 Fortunately we had some fruits and vegetables and snacks, and Jan provided us with a hunk of meat and some other supplies so Mei Ling was able to put together a satisfying dinner. The kids swam in the pool and played with the dogs and fed the animals. Breakfast the next morning came courtesy of Jan. 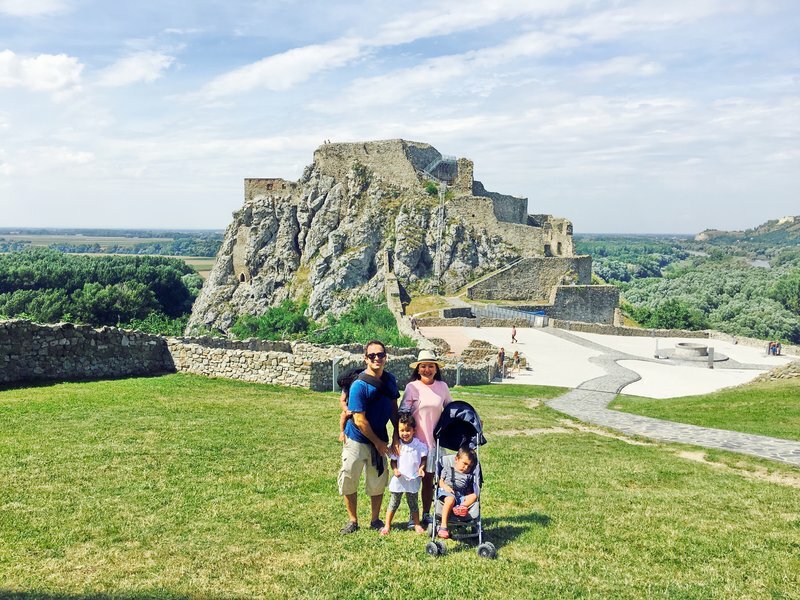 Unfortunately I had to decline his offer to show us around hidden castles and other secrets of the Slovakian countryside as we had an important stop on the way to our next overnight destination. The kids had a couple of hours to play and all too soon we were bidding goodbye to Jan, Tina, and the farm. 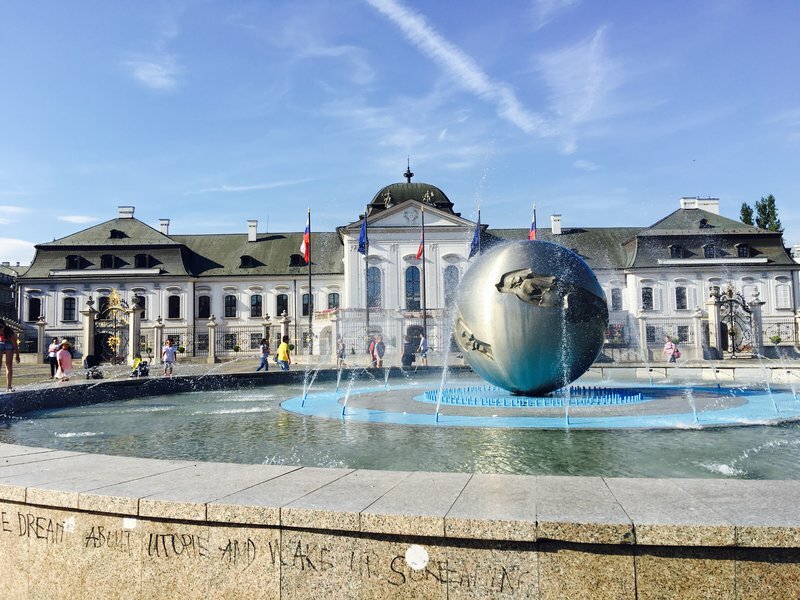 My Lonely Planet devoted considerably less space to Slovakia than to its neighbors, but I was determined to have some experiences that would allow us to see what made the country unique. 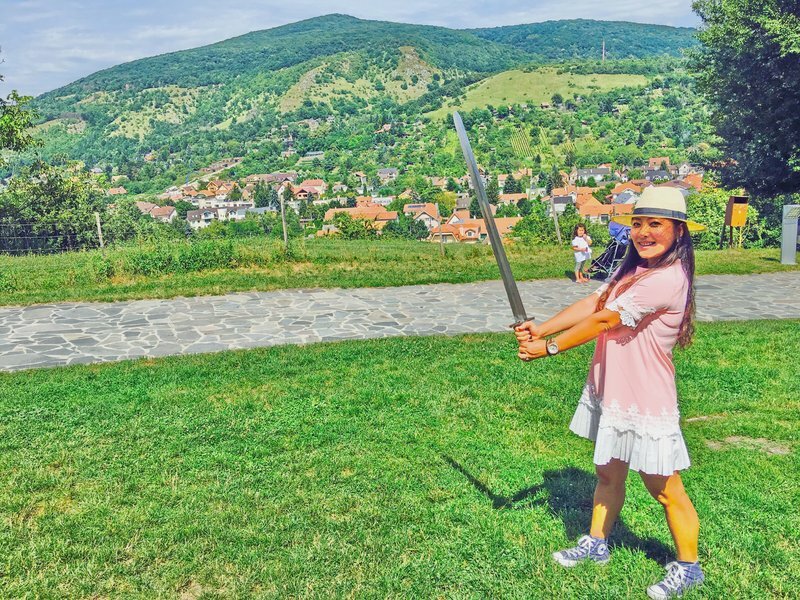 The medieval town of Banská Štiavnica was an obvious choice, offering preserved 16th century buildings and castles. 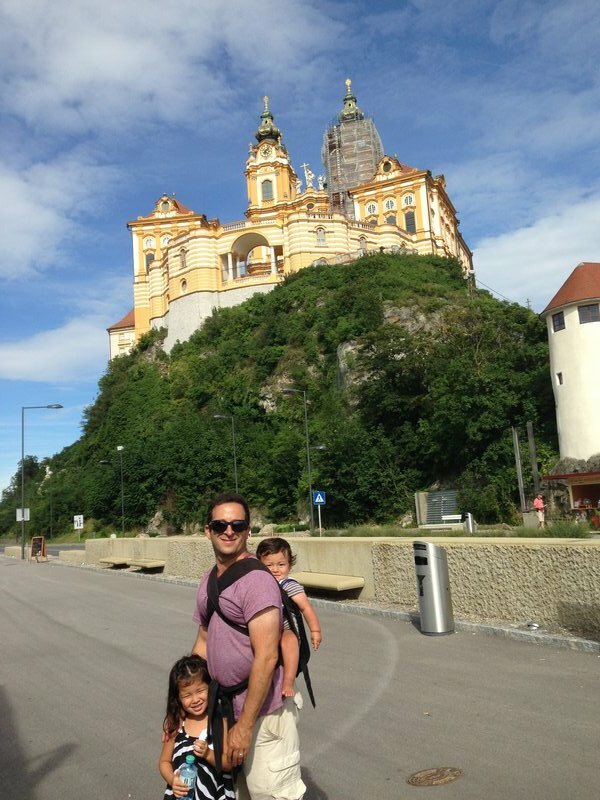 We enjoyed our walk there, although the castles didn't seem to be worth the trouble of an internal viewing. 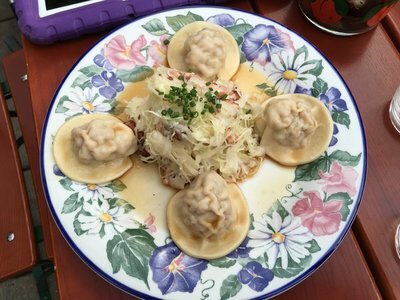 The best part of the stop in Banská Štiavnica ended up being lunch at 4sochy Cafe, which we found on TripAdvisor. 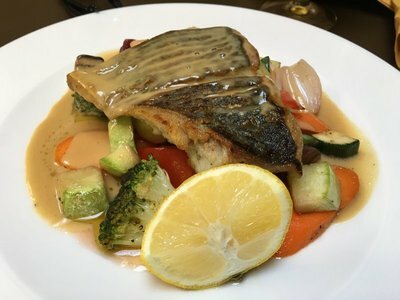 Despite appearing to be a cafe or wine bar with a limited menu at first glance, it turned out to be a very high end gourmet restaurant with delicious and complex French cuisine. It proved to be the best restaurant meal of the entire road trip. 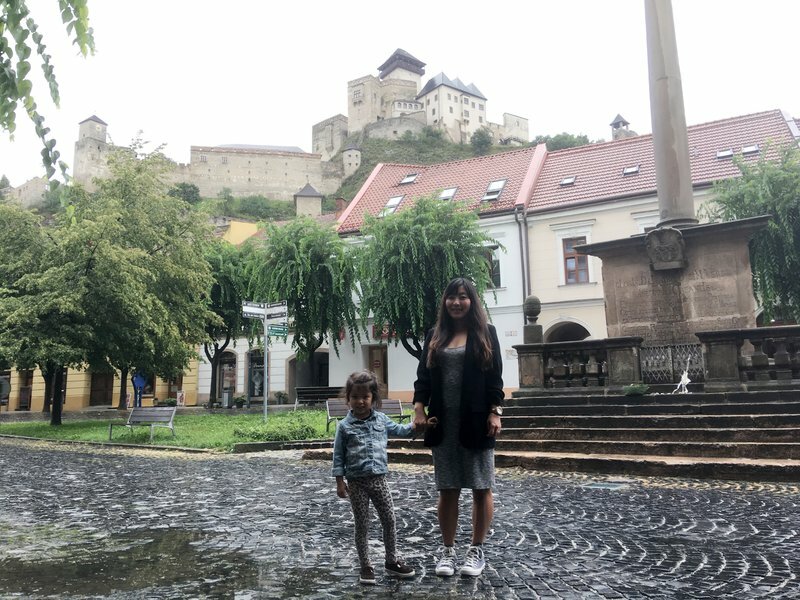 Our overnight stop was Trenčín, a larger city near the Czech border with a good-sized pedestrian old town and a fortress-like castle perched on a steep hill above everything. We arrived too late to do anything except walk into the old town and grab dinner at a Japanese restaurant. In the morning it was raining briskly so we had lunch in a restaurant that was almost entirely underground with a very local vibe. When we got out it was still raining and it was clearly not going to be possible to make the climb up to the castle. 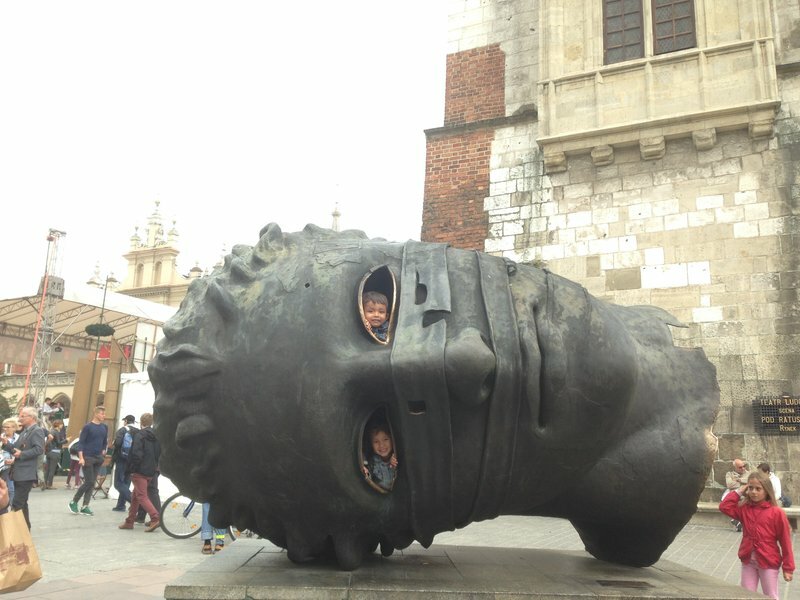 We decided to drive on to Krakow with our tails between our legs. Trenčín was the only stop of the trip that ended up being a near-complete loss. 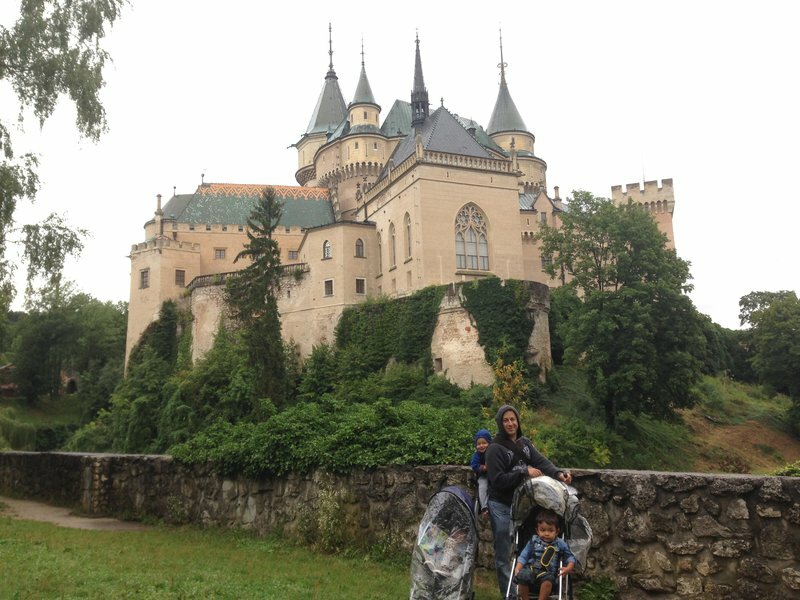 Slovakia had one last pleasant experience for us on the way out, the relatively modern Bojnice Castle. 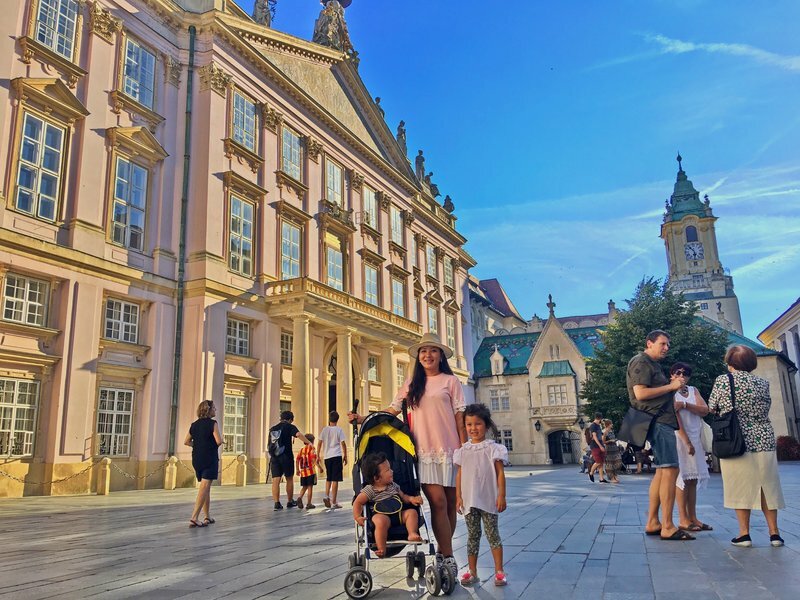 Slovakia's answer to Neuschwanstein has been rebuilt and renovated numerous times over the last thousand years, and is surrounded by a lush park. 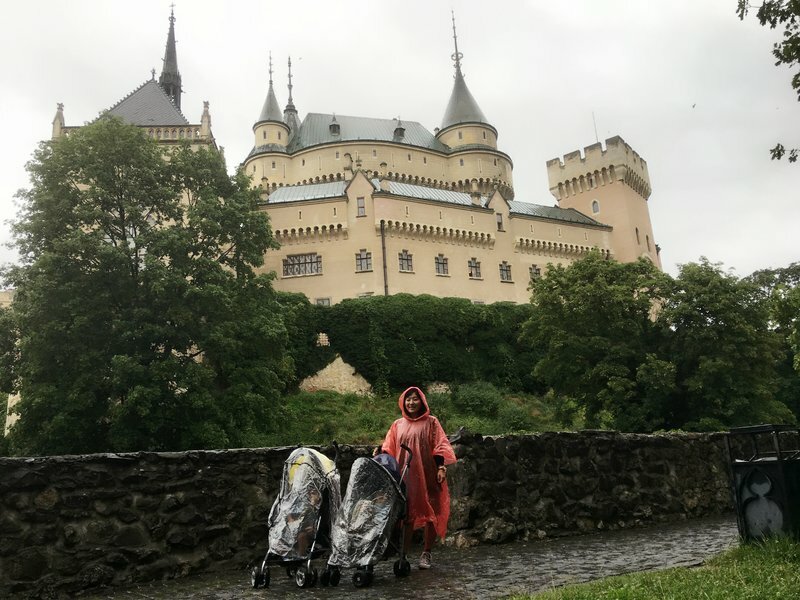 It was still raining, but not oppressively, and the moisture seemed to enhance the fairytale quality of the castle and its verdant surroundings. 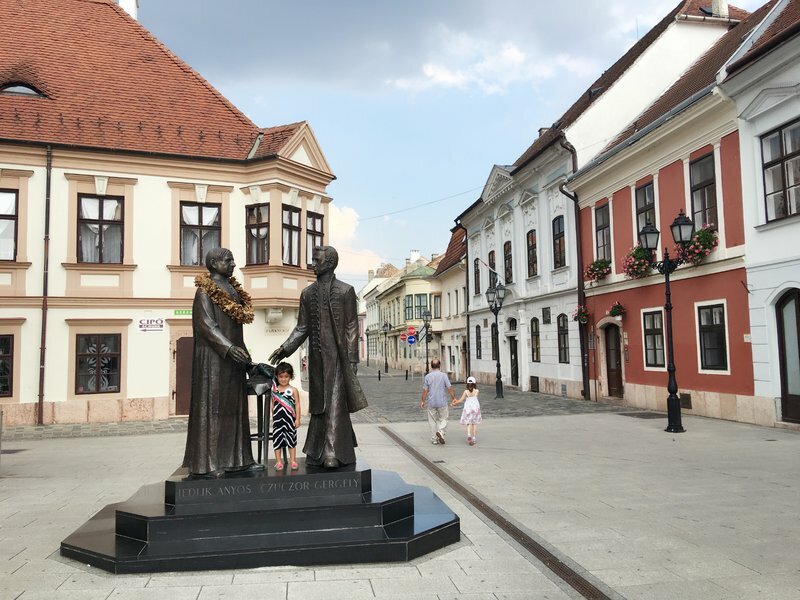 Just over the Hungarian border, we stopped off in the pleasant town of Gyor. Figuring out parking proved to be problematic as all instructions on meters were written in Hungarian only. 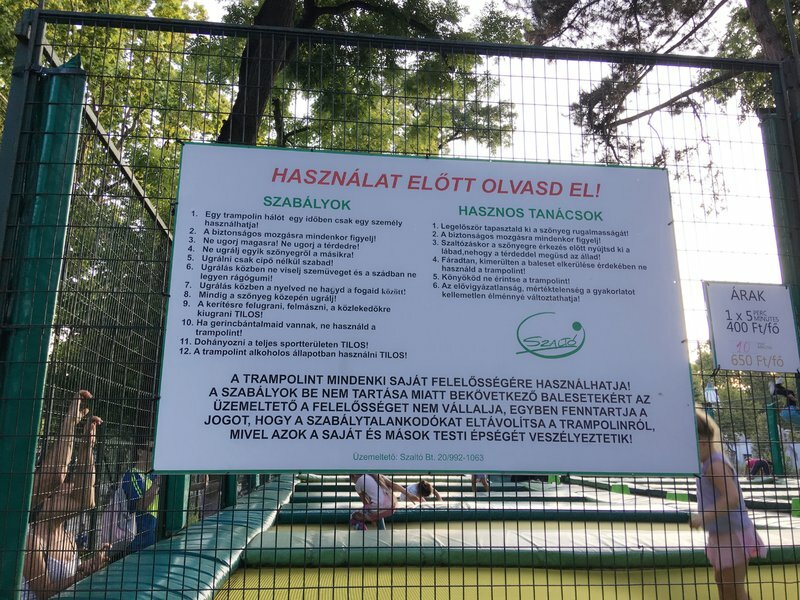 I can pick out the meaning of a few words in virtually any unfamiliar European language, but Hungarian is an exception. It has nothing in common with Latin, Germanic, or Slavic languages, not being derived from the Indo-European tree at all. It's more closely related to central Asian languages, along with Finnish and Estonian. The bottom line was I might as well have been looking at signs in Klingon. 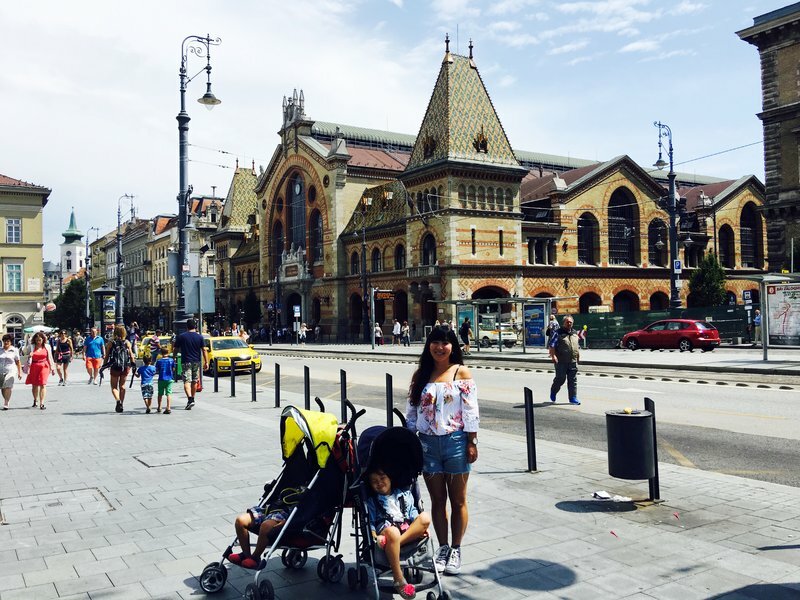 I found a bank and was able to withdraw some forints, the local currency, without too much difficulty. I broke a bill buying some drinks and returned to the SUV, where with the help of my offline Hungarian dictionary app I managed to put some time on the meter. 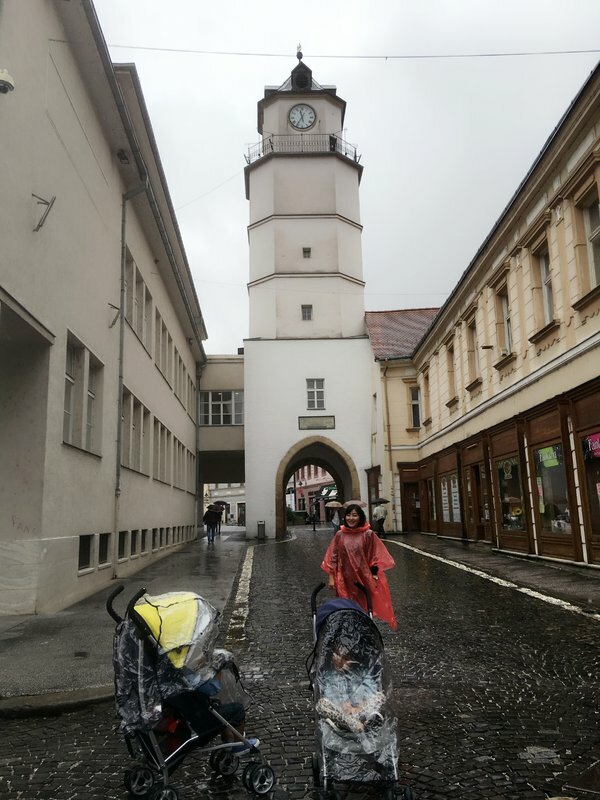 I wasn't exactly sure where we stood with the time, so I spent most of our stay in Gyor with the uneasy feeling the SUV was going to get ticketed or worse. We got through the touristy old town fairly quickly. The buildings and streets were very well kept, although there wasn't much particularly memorable about the place. The most impressive structure was the 17th century Basilica with its imposing triple apse. 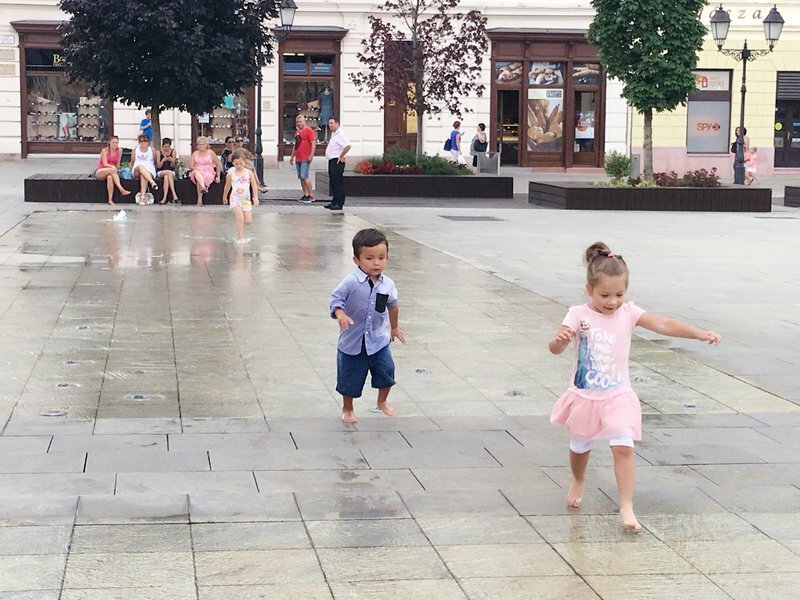 I might have forgotten Gyor entirely if we hadn't encountered a wide open square in the center with a group of burbling water fountains that was a great spot for the kids to cool down in the summer heat. Lots of other families with kids had the same idea. 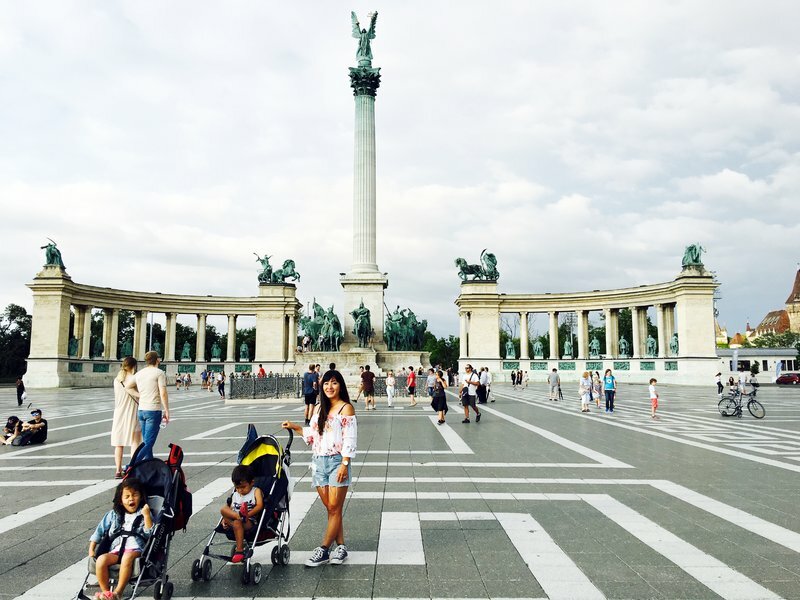 Driving into Budapest was particularly fun because unlike our arrival in Vienna it was still light and we could see the majestic boulevards and beautiful architecture that the city is famous for. 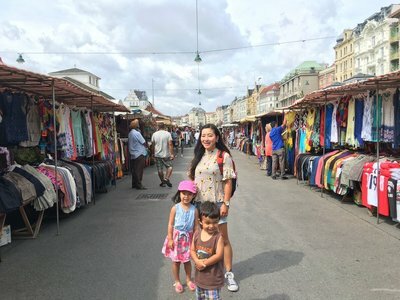 We met the Irish property manager at our Airbnb a block away from the Central Market Hall on the Pest side of the Danube. 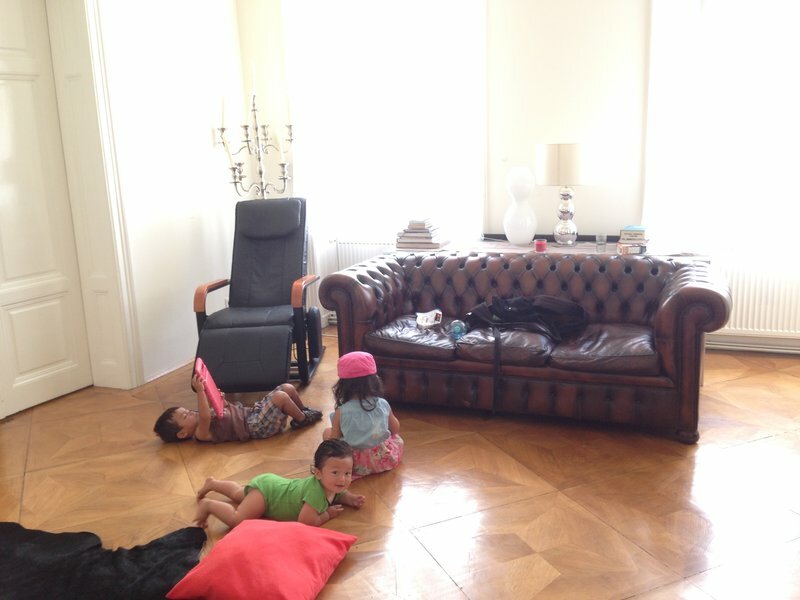 As in Vienna, our apartment was atmospheric and spacious. 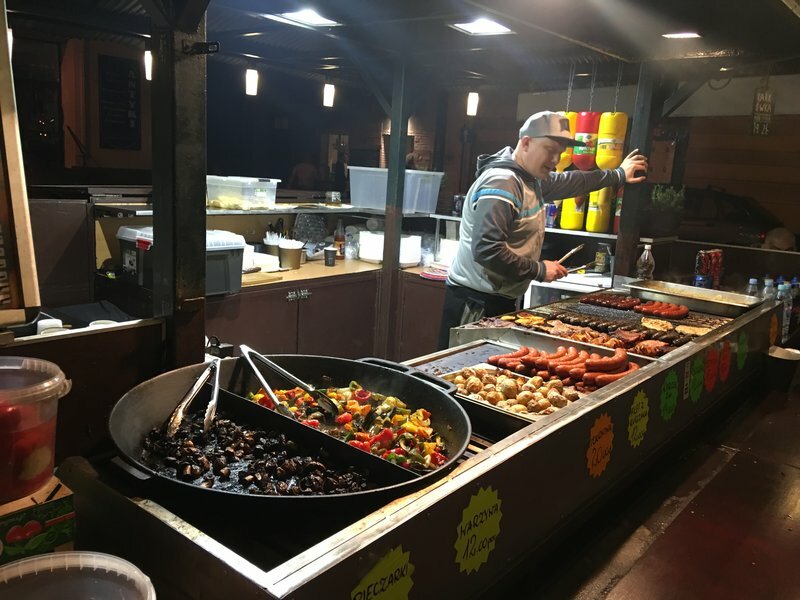 After we settled in, our host directed us to a restaurant street a couple of blocks away where we had a decent dinner of goulash, duck, and grilled vegetables. 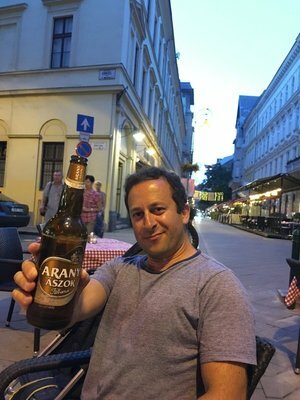 I also discovered a dark local beer called Arany Ászok Félbarna that I liked. 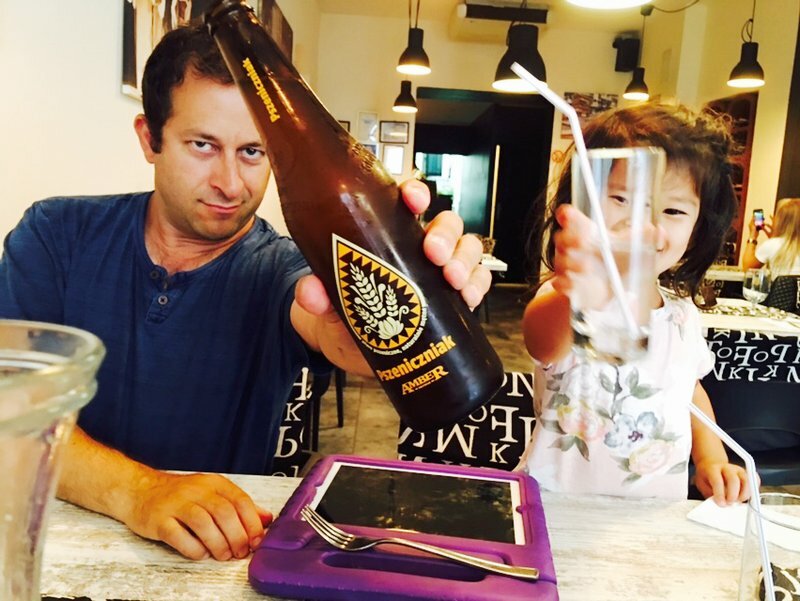 It turned out to be impossible to find in supermarkets, so I had to be content with drinking it in restaurants. 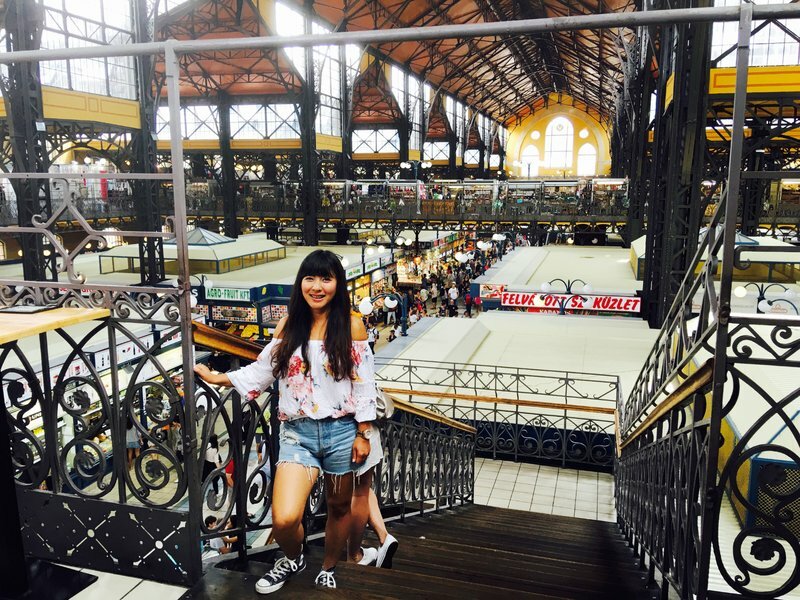 We began the next day in the Central Market Hall. 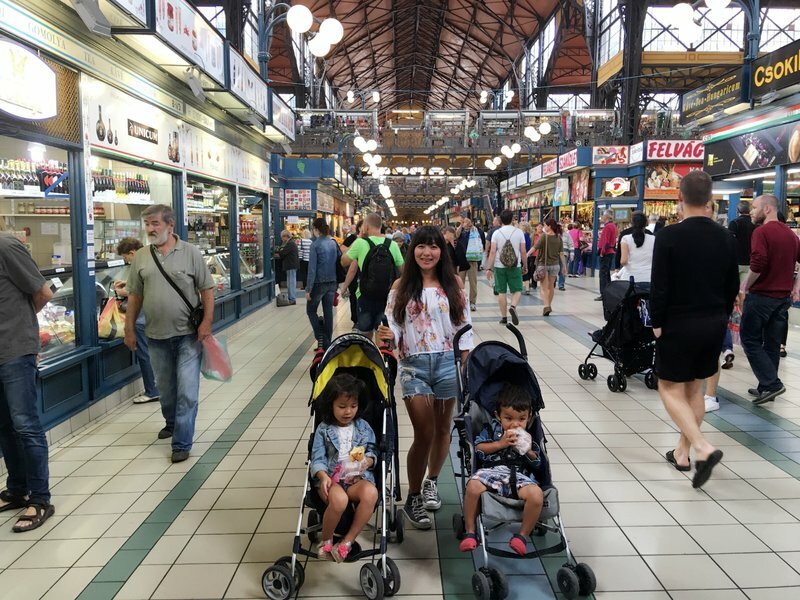 This is the largest covered market in Budapest but also the most popular with tourists, and on Saturday morning it was a mob scene. The selection of produce and other goods on the first floor was excellent. On the second floor were stalls containing various kitsch catering to tourists and also food stalls that were mostly too crowded to try. 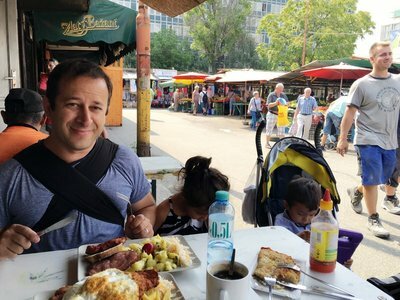 We eventually opted for a sit down buffet restaurant inside the market which was mediocre, but we got to try a lot of local specialties like stuffed cabbage and sauerkraut. 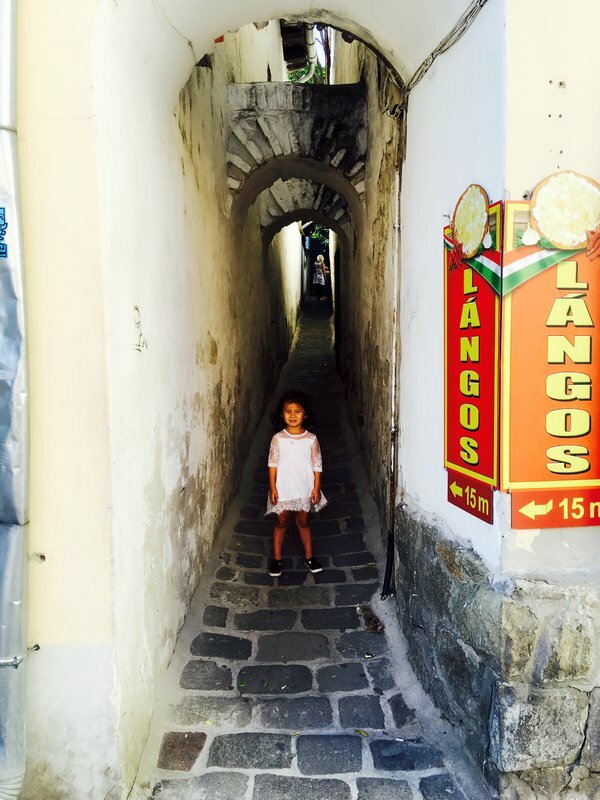 We launched into the best part of every visit to a new European city, the day-long exploration by foot. 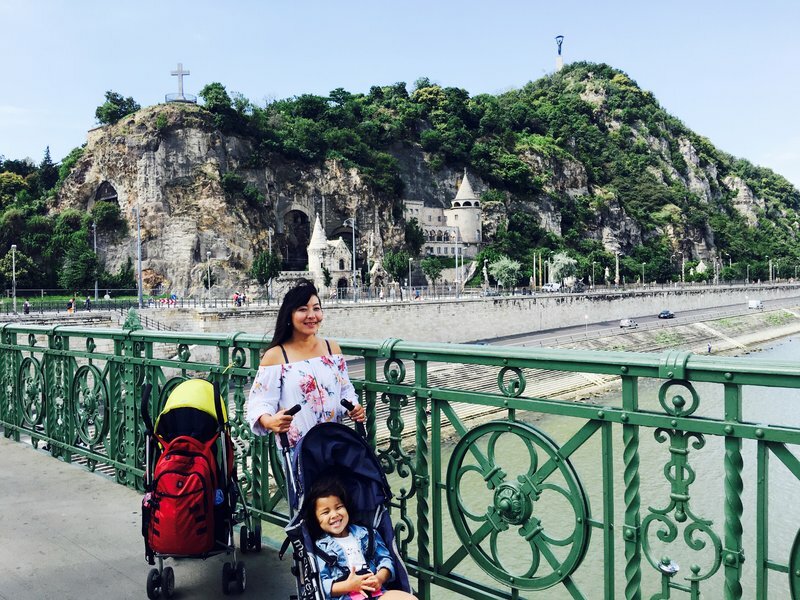 We crossed the green Liberty Bridge over the Danube to Buda, with great views of Gellért Hill and the Cave Church carved into its side. It was a long walk to Castle Hill but there was plenty to see on both the land and the river sides. There was a long line for the funicular at Castle Hill so we decided to take the inclined path instead. 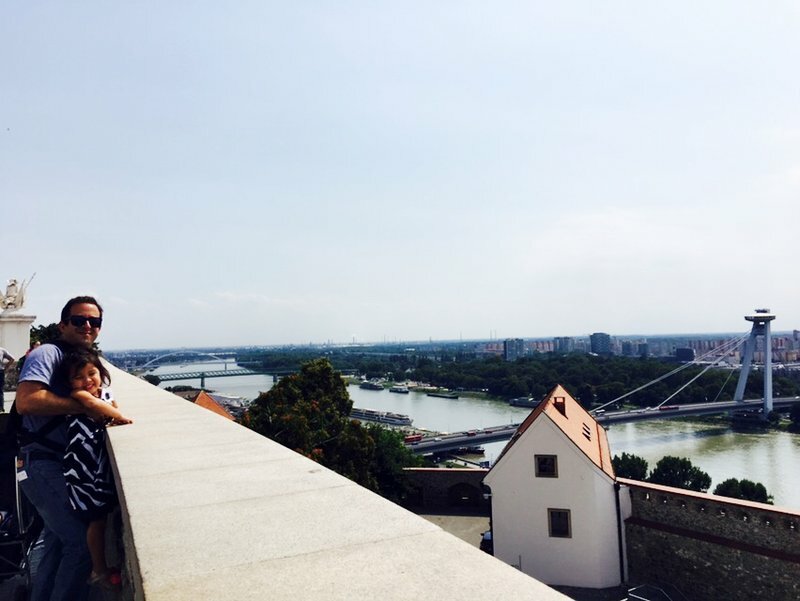 There wasn't much to see outside the castle except for the views over the Danube. Inside of the castle are the art and history museums, which aren't for us. 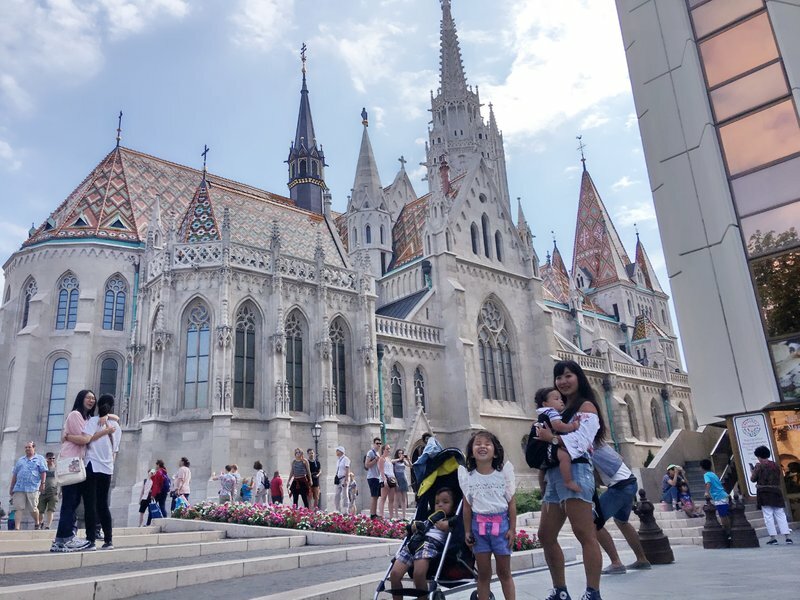 There was more eye candy a ten minute walk to the north, where the majestic Matthias church rules over a small square at the apex of the Castle District. 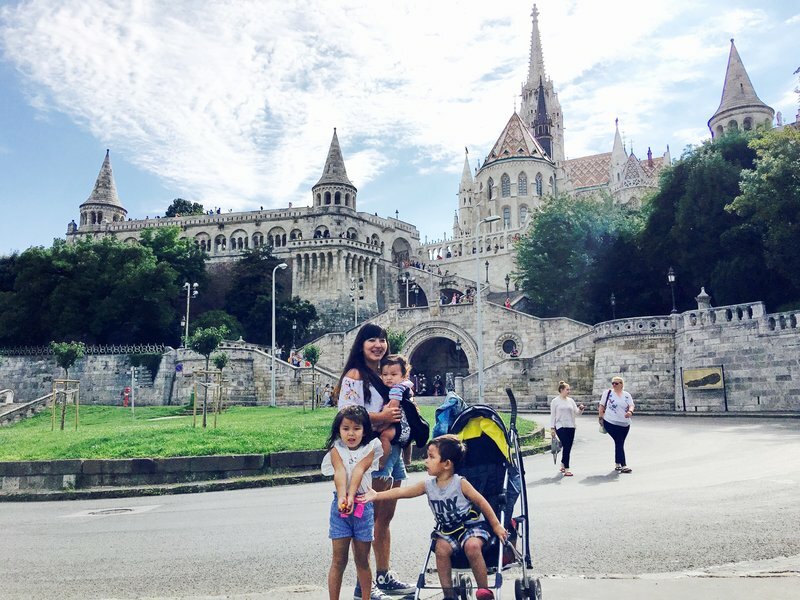 Close by is Fisherman's Bastion, a spacious terrace with neo-Gothic towers and parapets. Cleo was thrilled to see a wedding taking place in one alcove of the terrace. On the way back down we ate dozens of tiny plums that grew on trees at the side of the road. 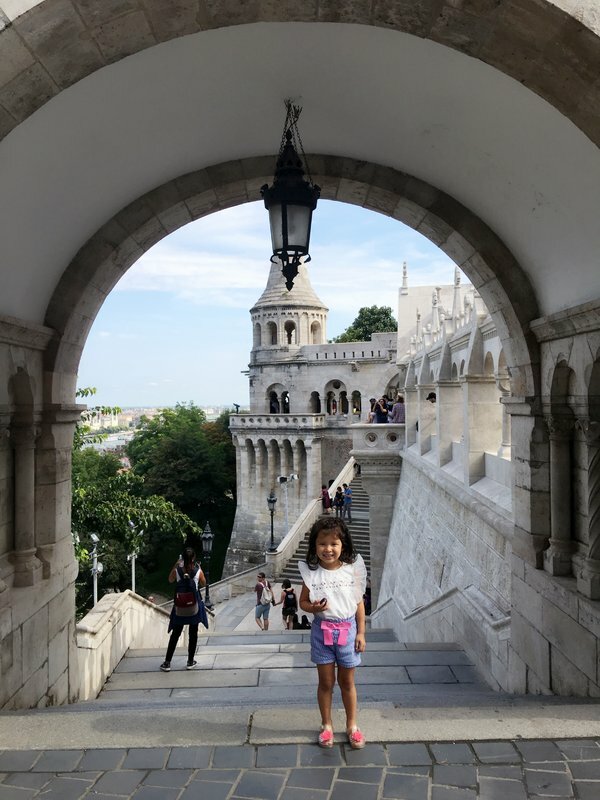 We took one last look at Fisherman's Bastion and Matthias Church from the lower level, then crossed Chain Bridge over the Danube to Parliament. I thought this was the most beautiful of all the buildings we'd seen that day. 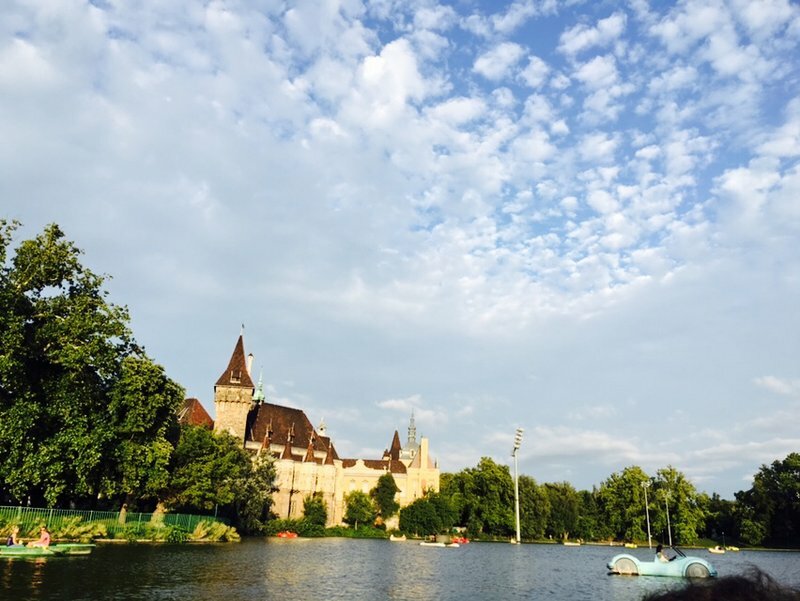 We took a long walk up central Pest's main boulevard, Andrássy út, to City Park where we took the kids on a pedal boat and admired Vajdahunyad Castle from the water. The park was obviously a major gathering and relaxation spot for locals. We took the kids to the playground and the trampoline to bounce around. Here's the sign with the trampoline rules. 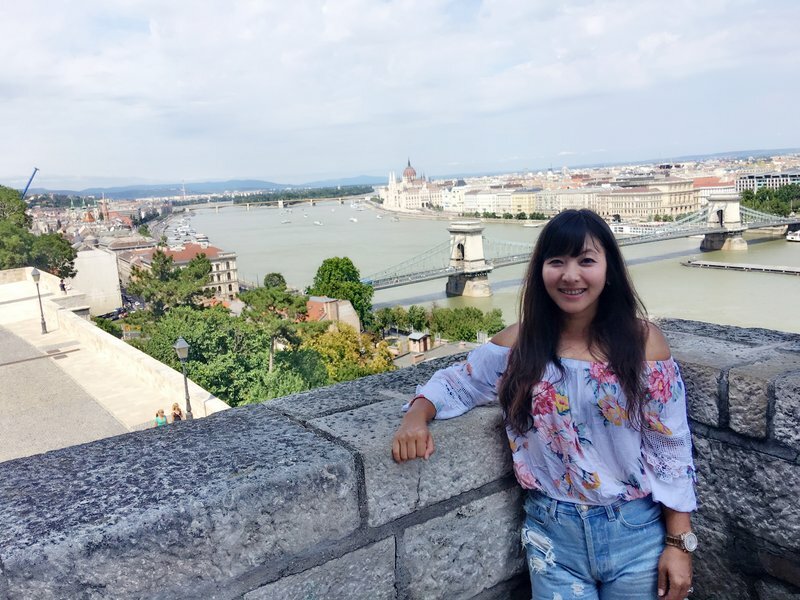 Feel like learning Hungarian? 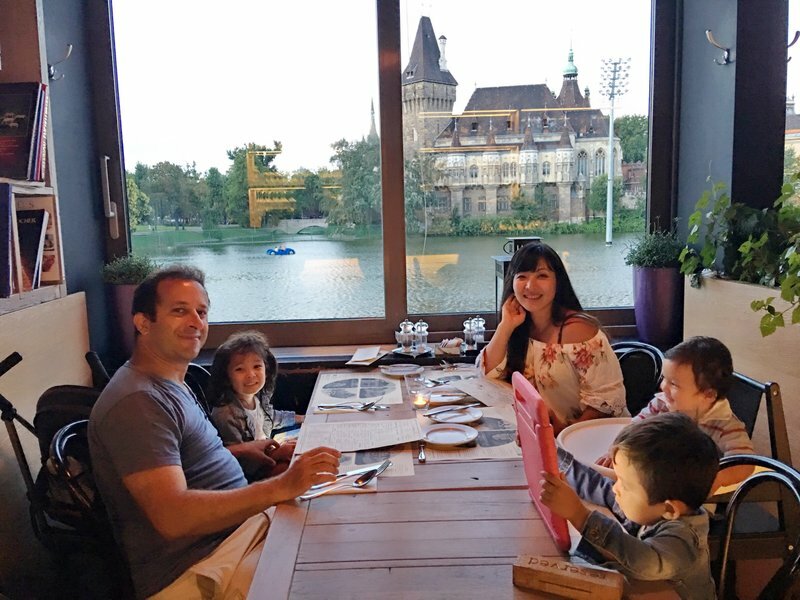 We ate at Városliget Café on the side of the lake, with a great view of Vajdahunyad Castle. 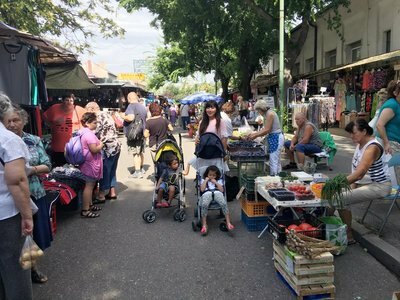 On Sunday the covered markets were closed but I had an ace in the hole, the Szimpla Farmers' Market, which is held weekly inside the oldest of Budapest's famous ruin pubs. 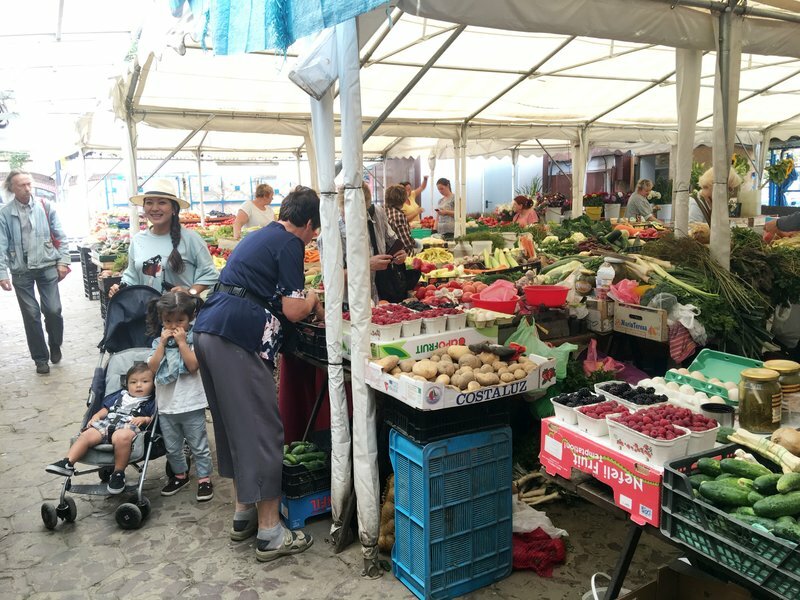 There was an eclectic mix of elderly Hungarian farmers manning stands laden with baked goods and cheeses, young local urbanites, and expats. The pub was a labyrinth of small rooms, staircases and terraces with the market at its center. 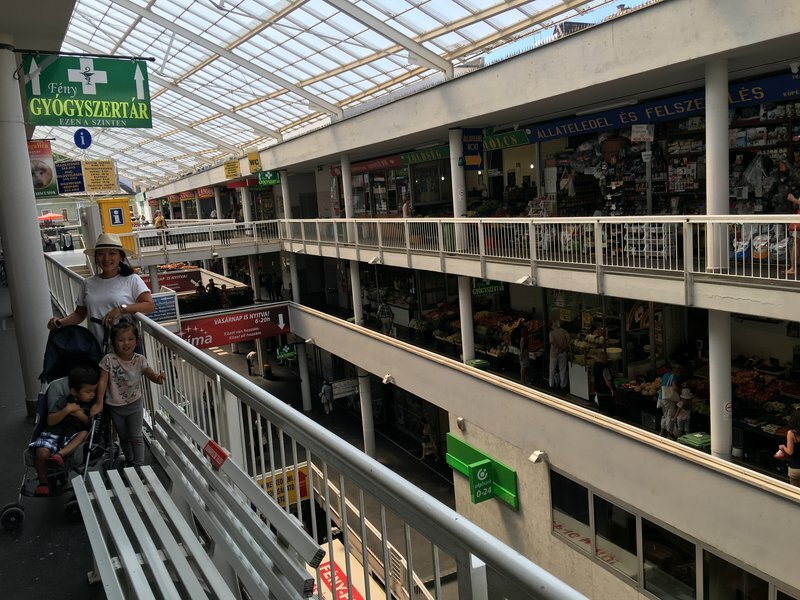 It was much smaller than the Central Market Hall, but we found much more that was to our taste and we had a large lunch of fresh, natural food. At one small cafe, a group of people were making pasta by hand and dishing out plates of it doused in delicious homemade tomato sauce. 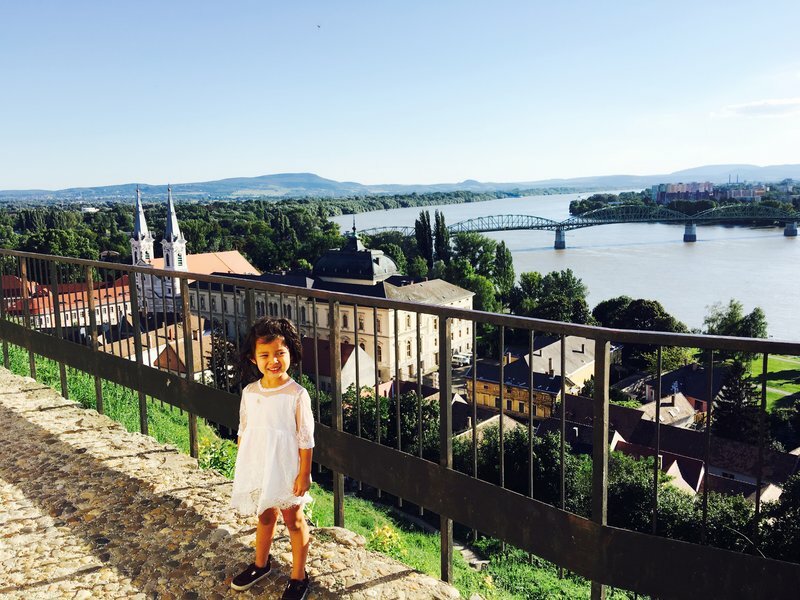 We'd covered so much ground the previous day, I couldn't think of anything else to do in Budapest so we headed north to the Danube bend, where several pretty and historic villages are nestled. 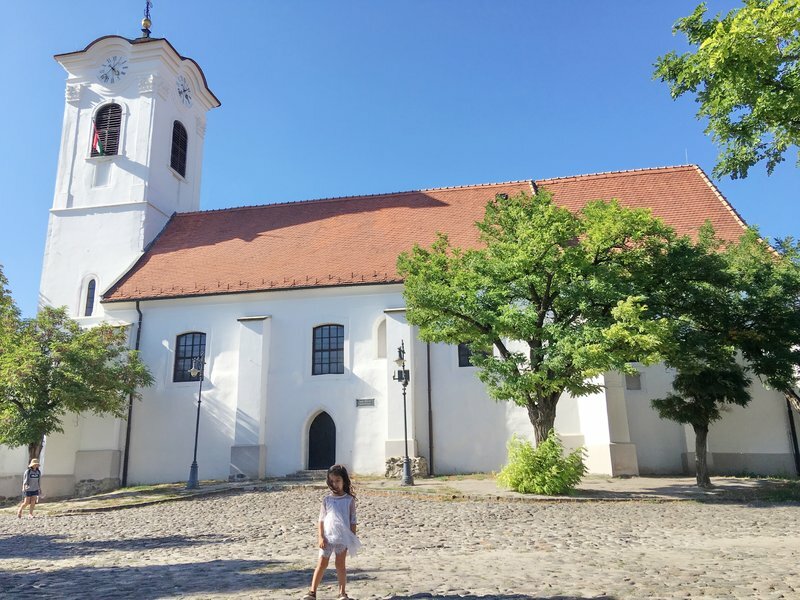 Szentendre, the most visited of all of these, abuts the narrower of two branches of the Danube formed by a temporary split in the sharp bend of the river. I missed the parking lot and nearly drove into the heart of the crowded pedestrian zone before a local thankfully waved me off. 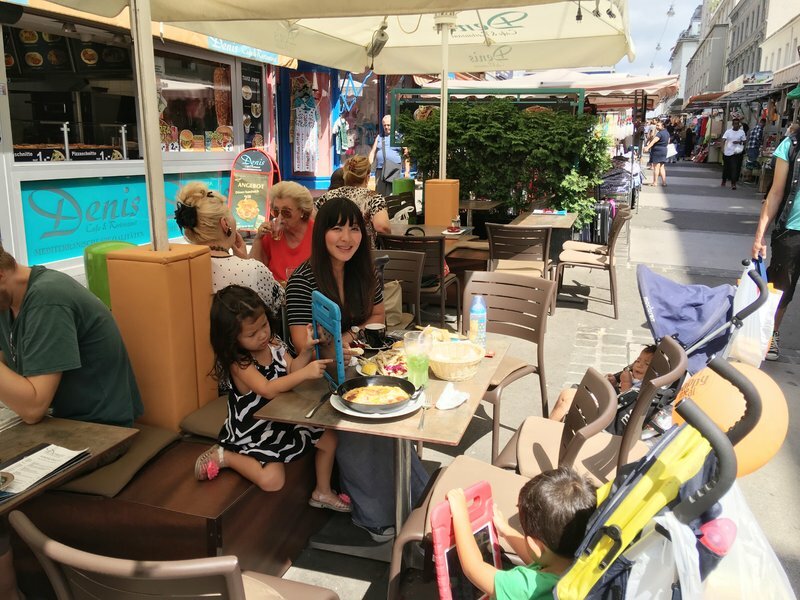 There was one main street mainly occupied with outdoor cafes and touristy boutiques, and we found lunch at a busy barbecue stall in the middle of everything. One block down was a promenade along the river, which was busy with boaters and paddleboarders. 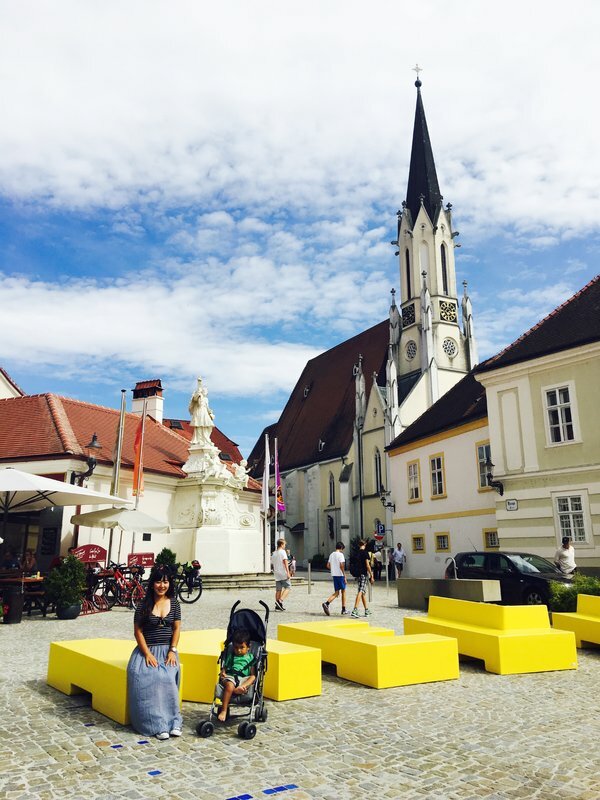 Back at the main square, Cleo discovered a narrow alley that led upstairs to the solitary Church of St. John the Baptist on Szentendre's miniature version of Castle Hill. 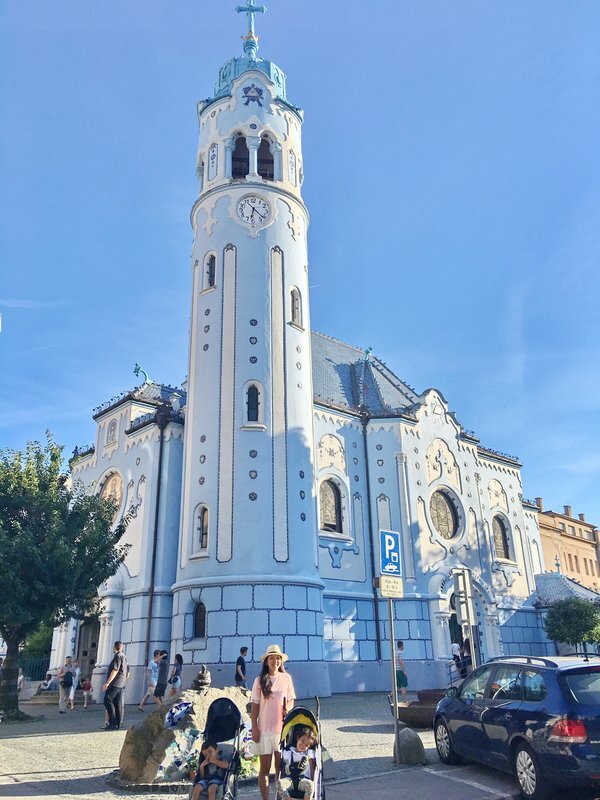 Despite the short distances between the towns on the map, the one lane roads were very curvy and slow so it was almost dusk when we arrived at Esztergom. 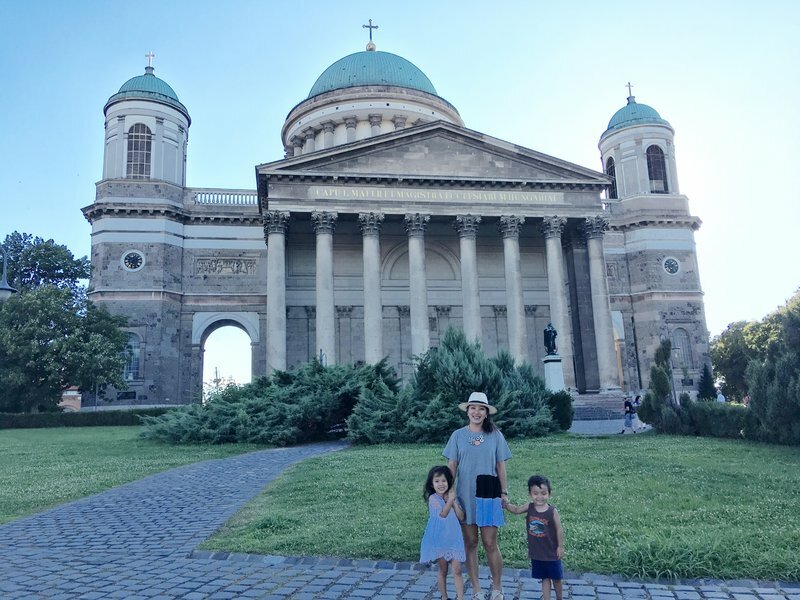 We only had time to walk around the enormous Renaissance Basilica before racing back to Budapest to make our dinner reservation. 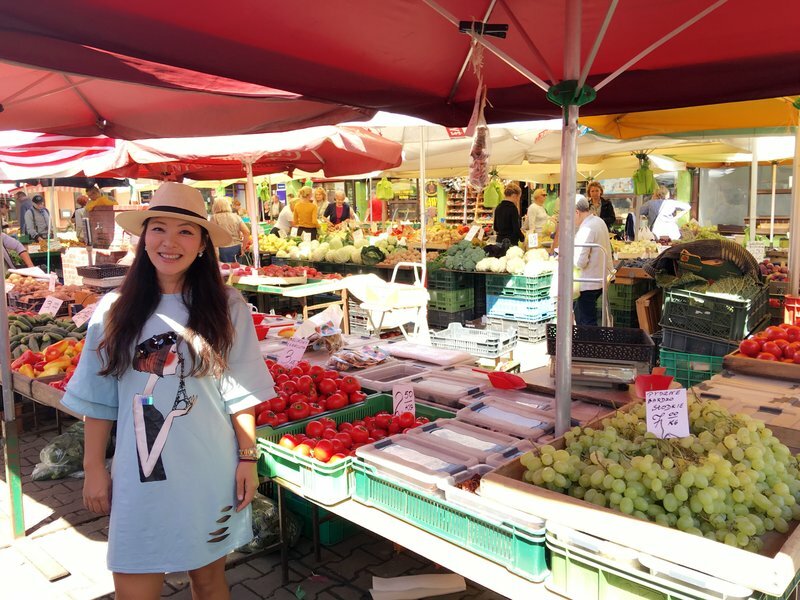 Monday morning we stopped off at a couple more covered markets, had lunch, and loaded up on fruit for the drive back to Slovakia. 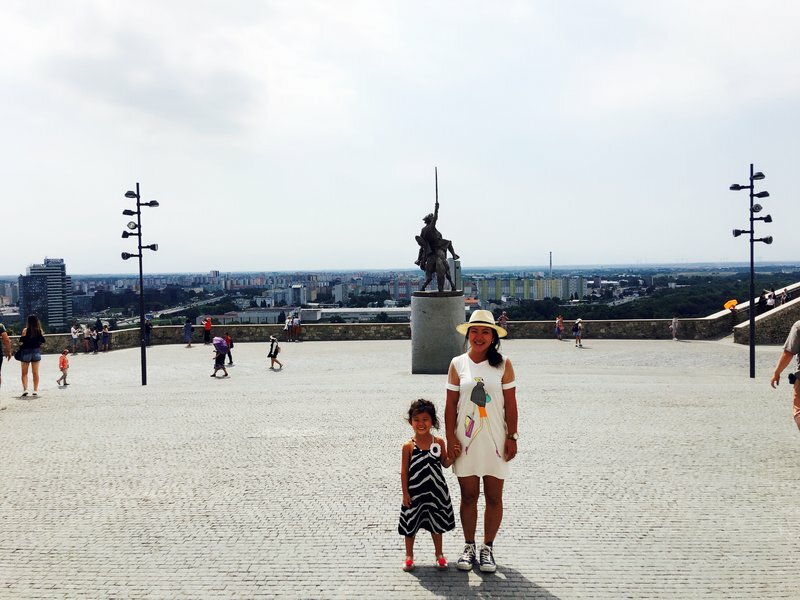 When I conceived of this road trip through the great cities of Europe, Bratislava was hardly even an afterthought. 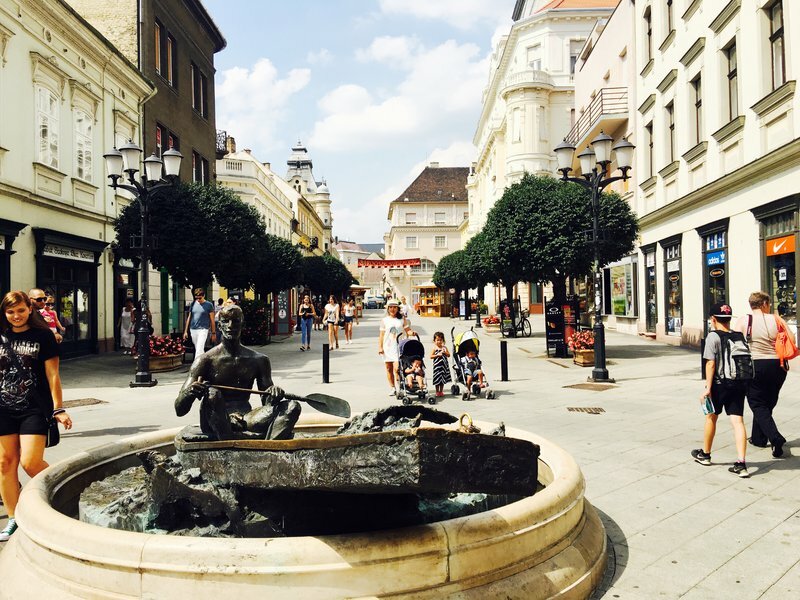 I knew nothing of the city except that it was the capital of Slovakia, a country I knew almost nothing about in its own right. However, given that it was directly between two of the major cities on our itinerary, it was an obvious place to investigate further. 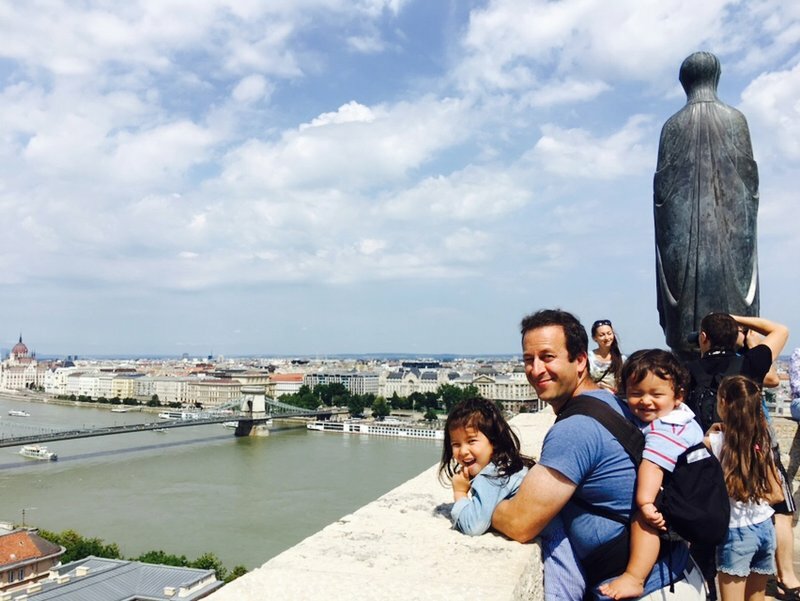 Once I read a little about what the city had to offer, I decided it was worth a two day stopover. This ended up being a fortunate decision since we arrived too late on the first night to do anything except give the kids a bath and go to bed. 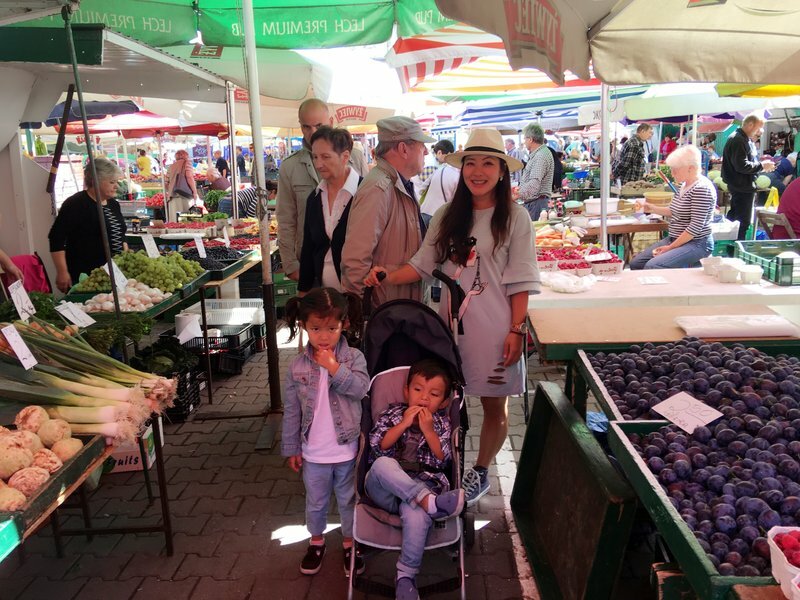 I had chosen our location to be close to the Trhovisko Mileticova outdoor market rather than the old town. 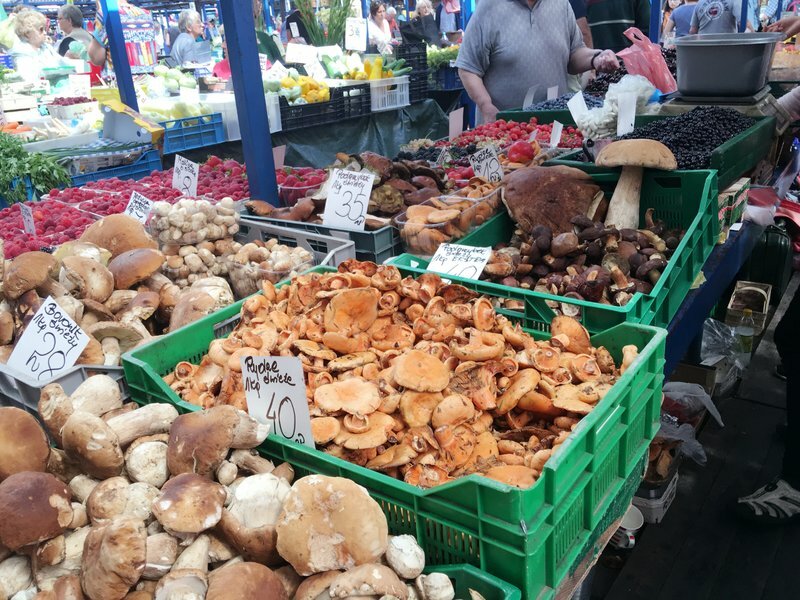 The market proved to be quite large with a nice variety of produce and a good selection of food stalls and restaurants. Surprisingly, there was a substantial Asian presence in the market and we got a huge lunch at a very popular Vietnamese restaurant. 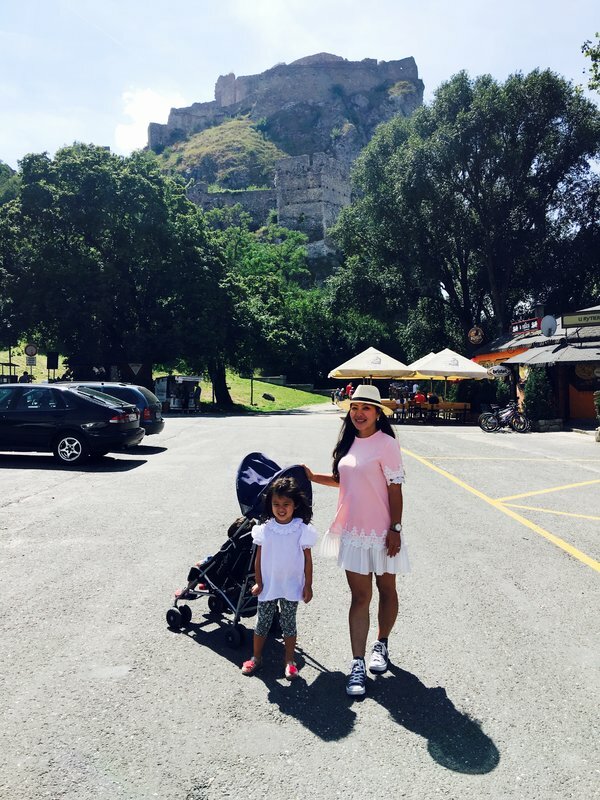 We drove slightly outside of Bratislava to see the clifftop Devin Castle at the confluence of the Danube and Morava rivers.. There was a winding paved path to the top of the cliff so we didn't have to struggle to reach the castle. 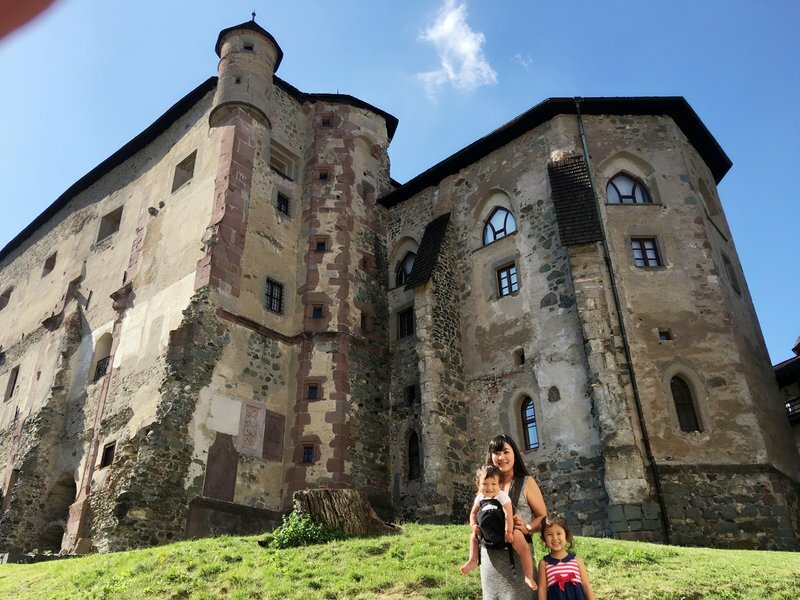 The upper part of the castle was closed but there was still plenty to explore and great views of the Danube and the little village in the valley below us. 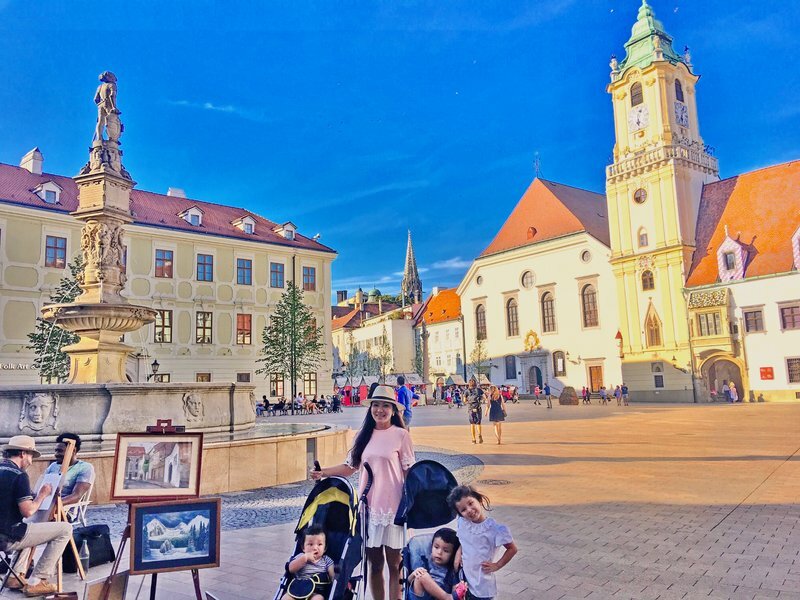 The well-known sights of Bratislava are concentrated in a small area downtown by the river, much of which consists of a walled pedestrian old town. 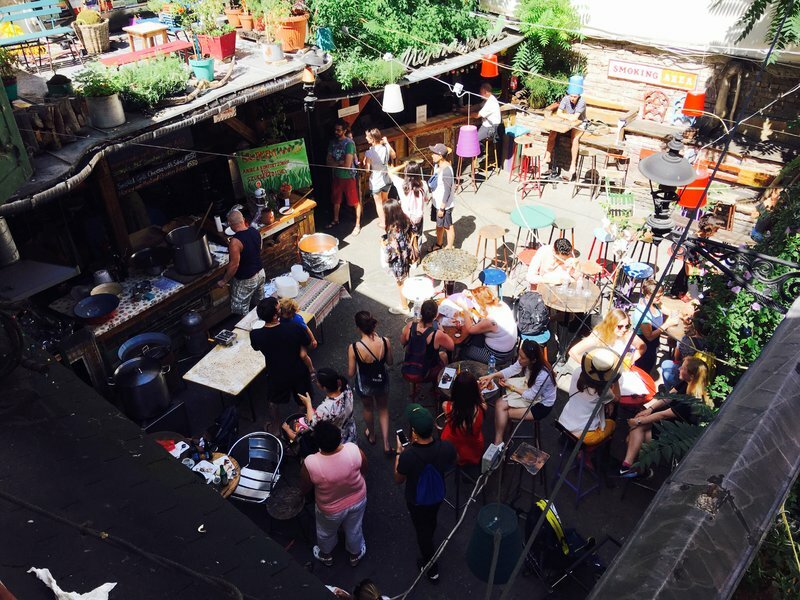 Here we found all the tourists of which there had been no sign in our residential Airbnb area or the market, including lots of large Asian tour groups. 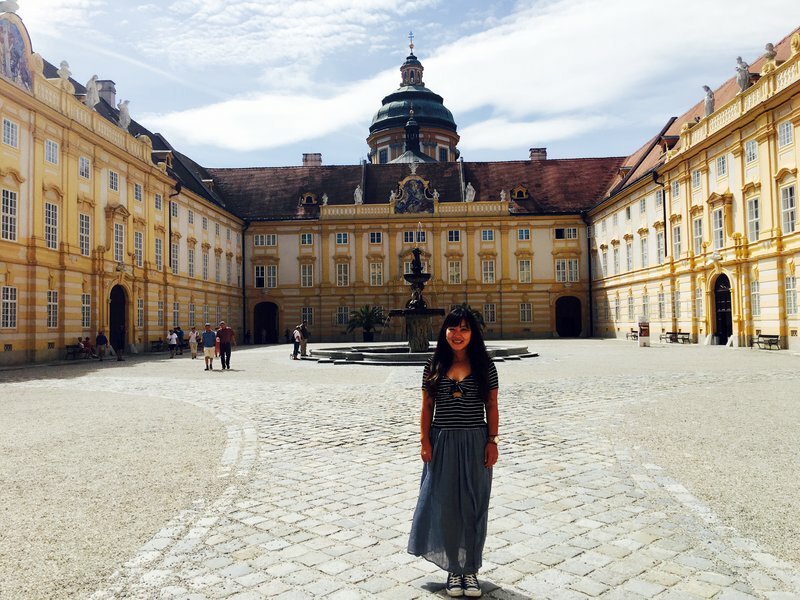 I asked Mei Ling why she thought Bratislava would be a popular destination for Chinese in particular, and she replied that it was probably sold as a cheap alternative to Western European capitals. 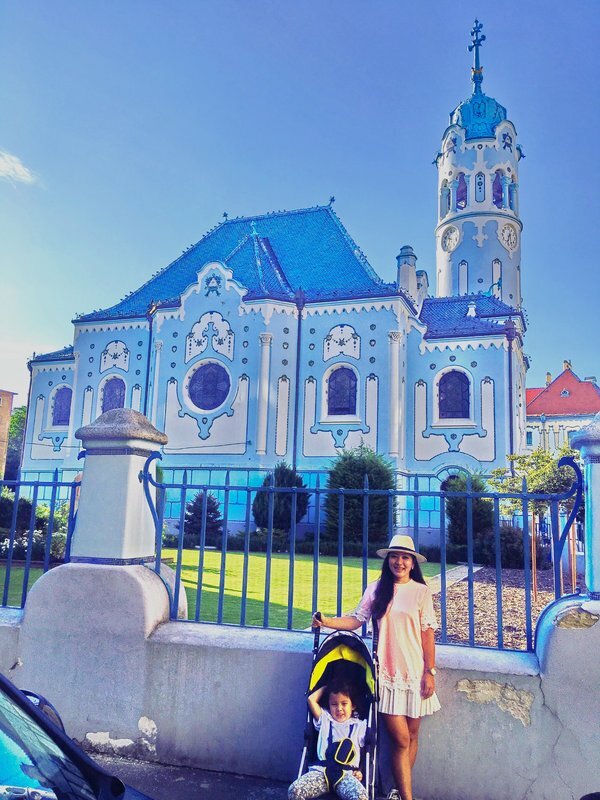 Just outside of the old town we found the Grassalkovich Palace, which is the current presidential residence, and the Blue Church of St. Elizabeth. The sky-colored early 20th century church looks like it wouldn't be out of place in Miami Beach. 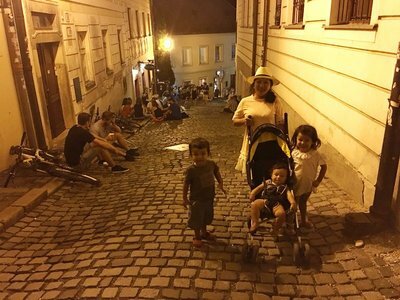 Dinner was al fresco at Modrá Hviezda, on the steep cobblestone road leading up to Bratislava Castle just west of the old town. The food wasn't spectacular, but the kids were so well-behaved that other people at the restaurant actually came over to congratulate us. On the way back down, it was clear that the road was a popular hangout spot for young expats. 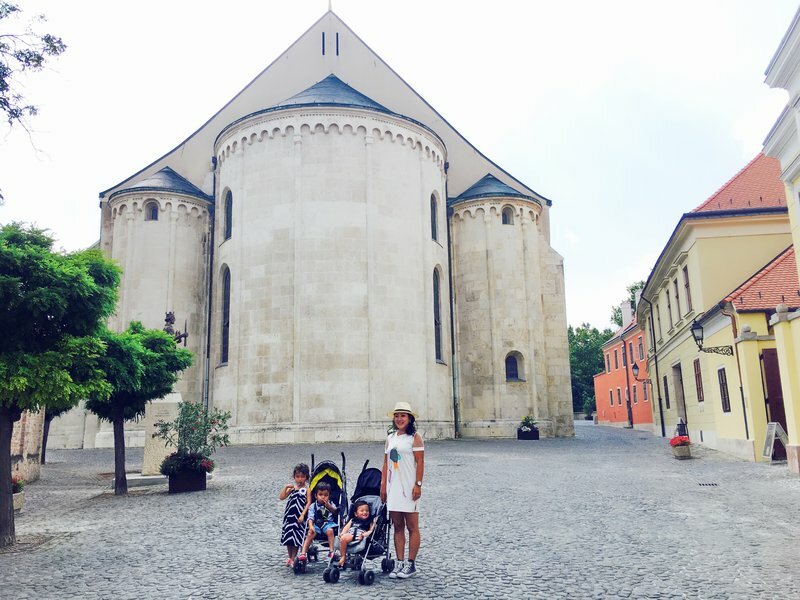 Bratislava might not be a well-known city now, but in ten years people may think of it as the next Budapest. 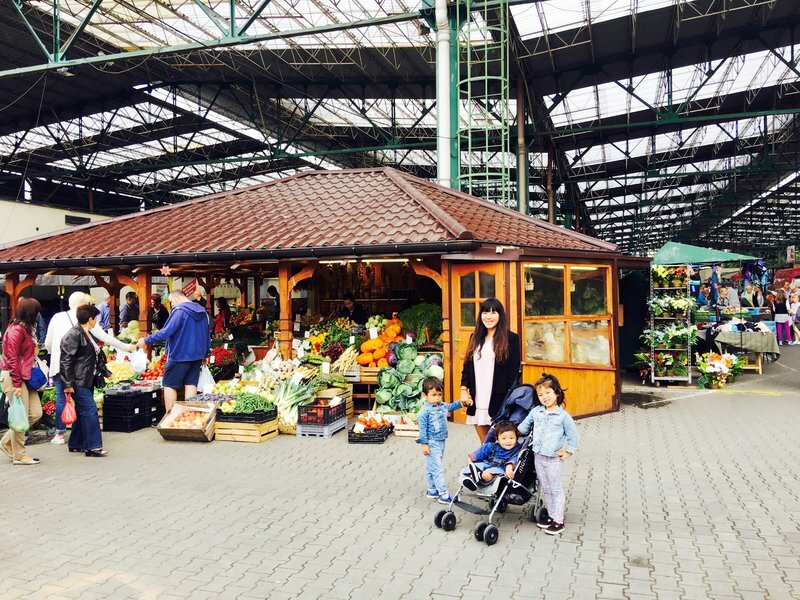 We went back to the Trhovisko market the next morning, where we had a more conventional Slovakian lunch. There was no English spoken so I had to make use of my limited Slovakian online translator and guesswork, but I think we did quite well. 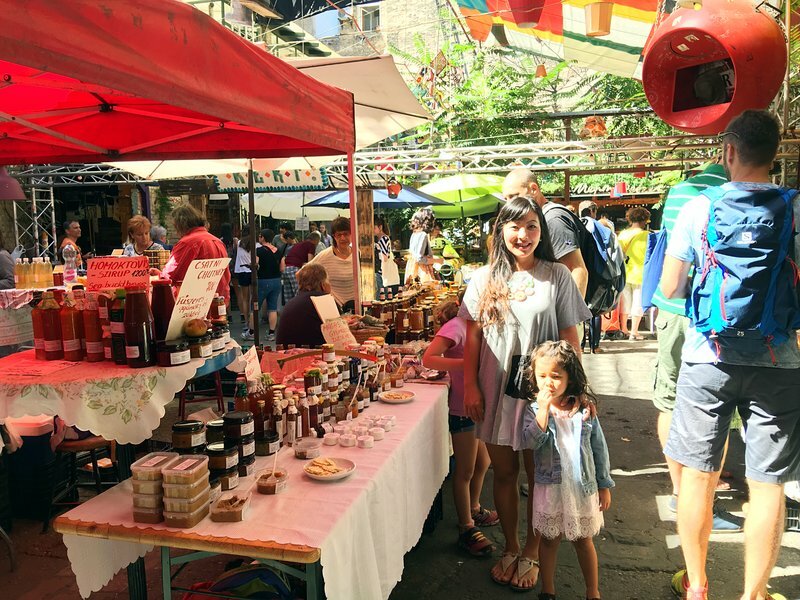 We noticed that the most popular item at the market seemed to be acai berries, which were being sold briskly from tubs and bins by multiple vendors. I was never able to figure out the reason for their popularity in that particular spot. 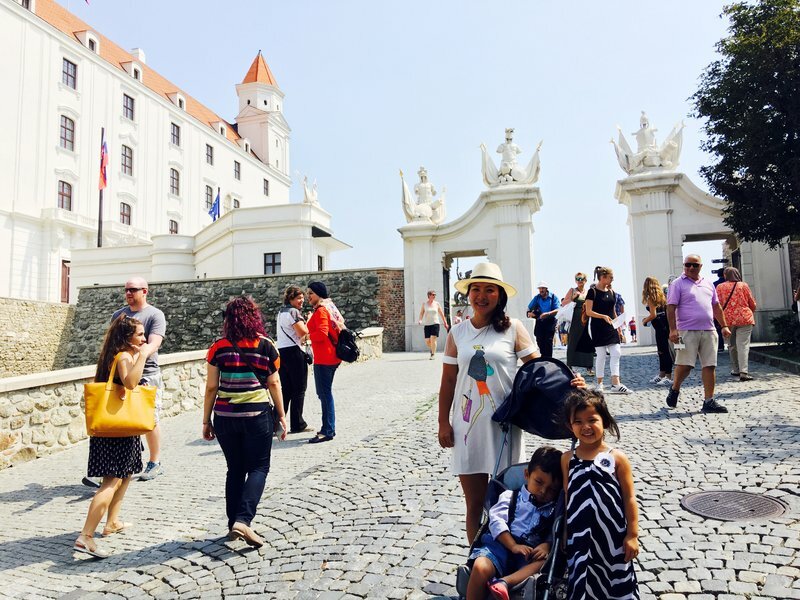 Our last stop before leaving town was Bratislava Castle, which we hadn't had time to visit the previous day. 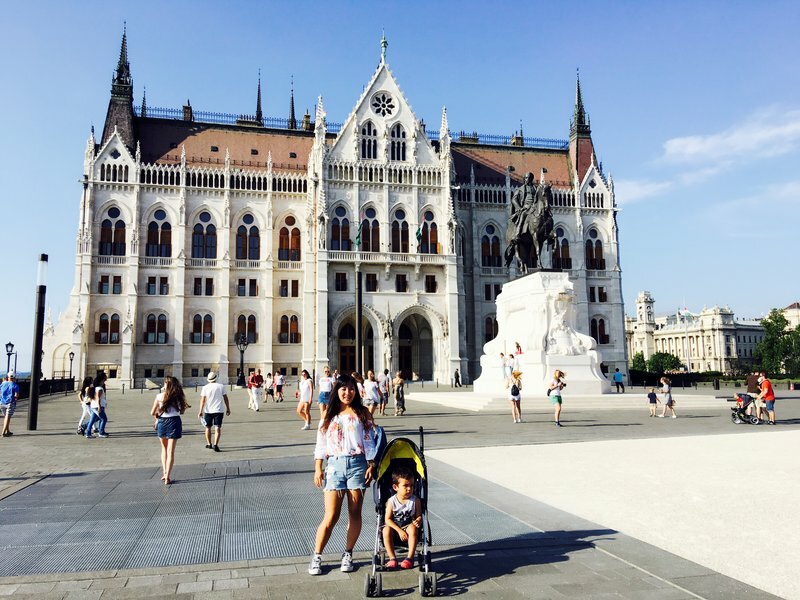 We had no particular desire for a tour of the interior so we spent a little time looking at the outside of the castle and the views over the Danube, and then we took off for Hungary. 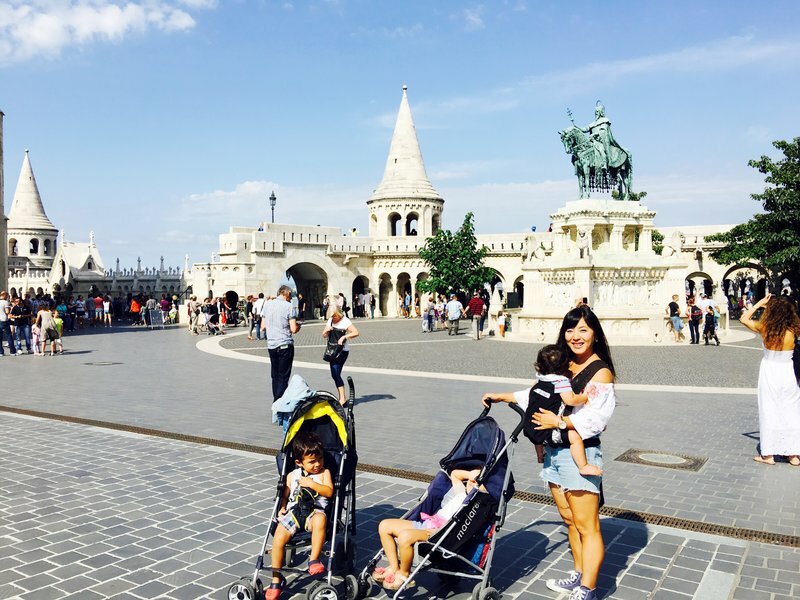 We were eager to see Budapest. 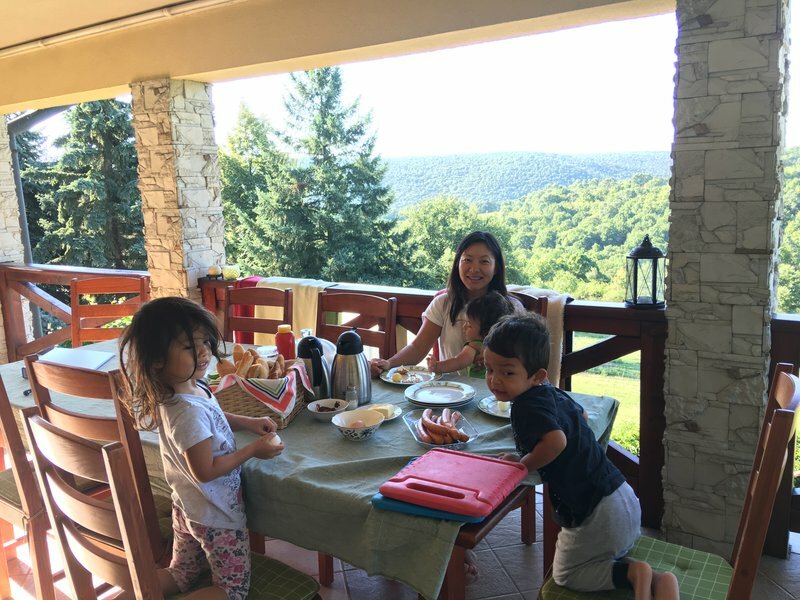 Our Airbnb in Vienna was simply awesome. 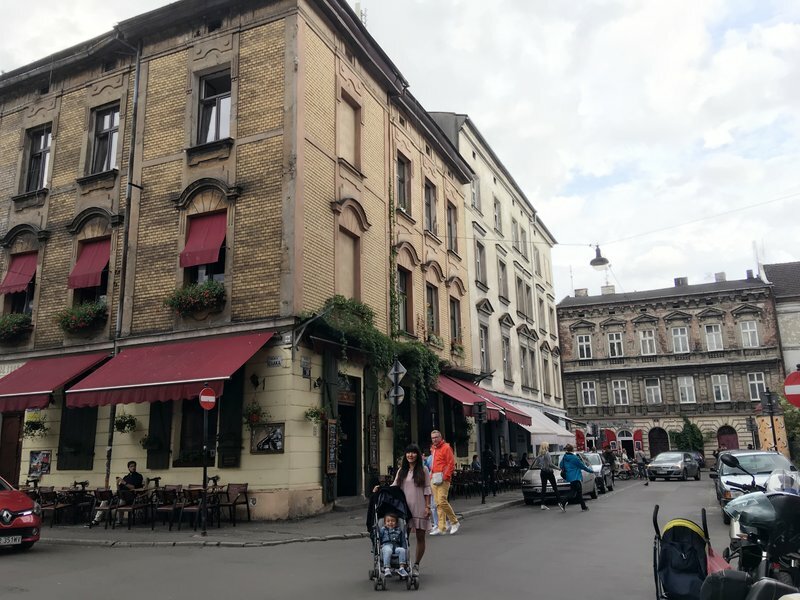 We were just south of the Bohemian district of Mariahilf, two blocks away from the Naschmarkt and within easy walking distance of the central pedestrian area. 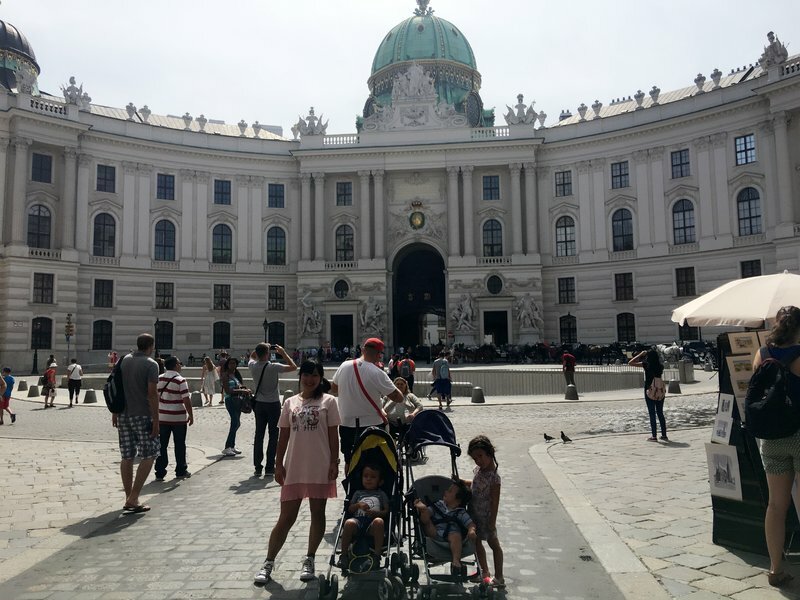 The building itself had a classical Viennese interior with a wide, winding staircase. The apartment was very spacious with tall ceilings and wooden floors. Best of all, there was free parking reserved for us right outside the back door. 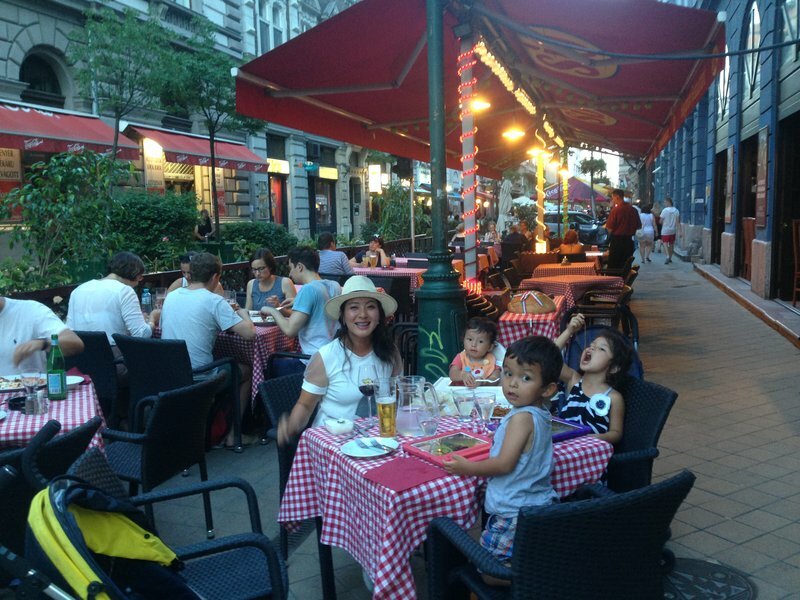 After a late arrival and dinner on Saturday, we set off Sunday for our grand walking tour of Vienna. 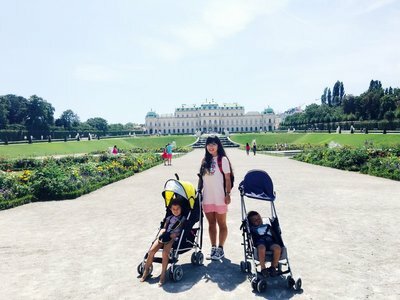 We took a long walk to the Belvedere Garden, which contains two 18th century baroque palaces and extensive grounds. 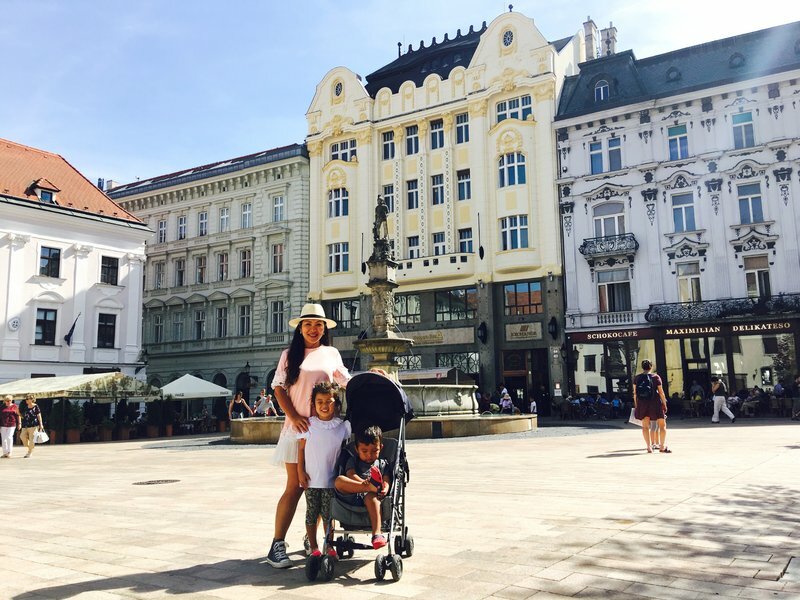 The most striking things about Vienna are the beautiful architecture and the wide boulevards. 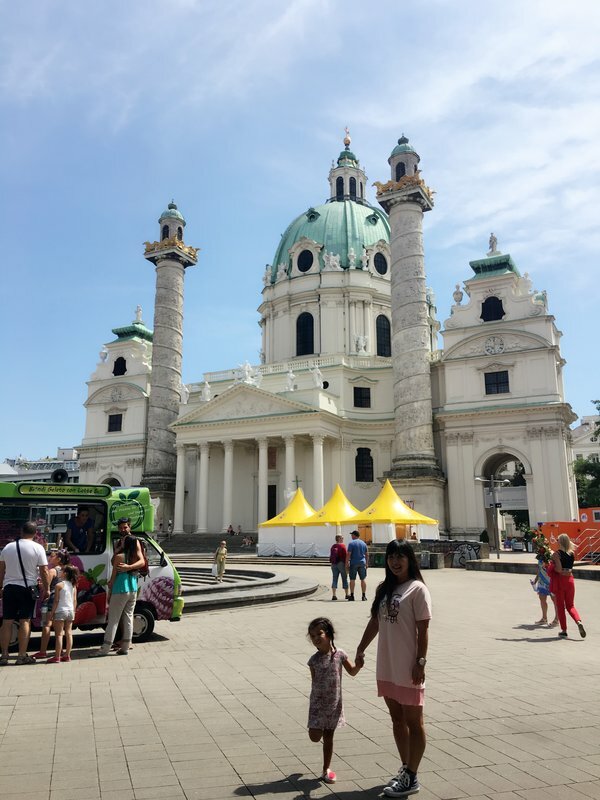 On the way to the Innere Stadt, or old town, we encountered the baroque Karlskirche with its iconic Romanesque columns and green dome. 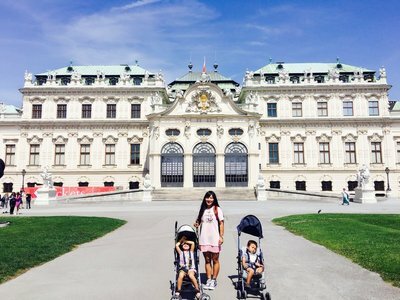 Once inside the Ringstrasse that surrounds the old town, we stopped at the Hotel Sacher for a taste of the legendary torte. 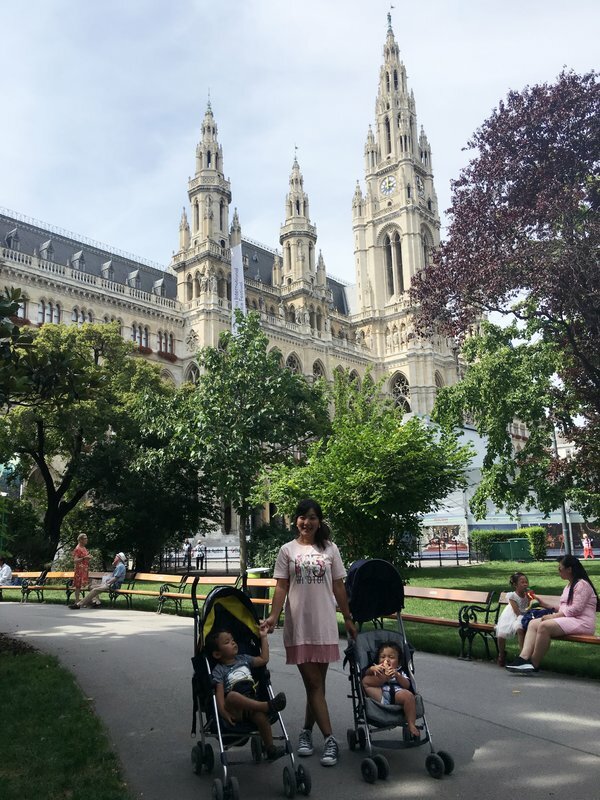 With a little more walking we encountered the Hofburg, the Volksgarten, and the Rathaus. Our last stop in the old town was possibly the most famous landmark of all, Stephansdom. 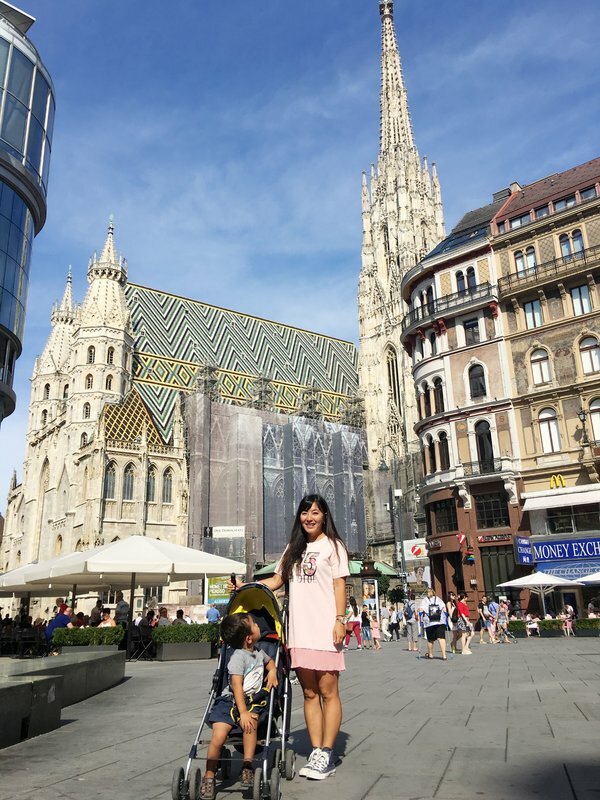 This 15th century cathedral was the tallest building in Vienna for centuries and survived near-destruction in World War II. 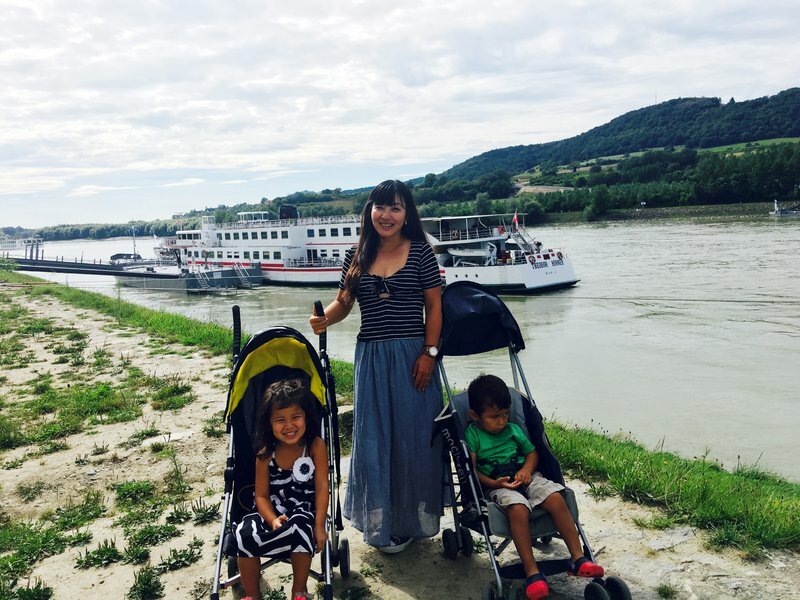 We walked across the Danube Canal to Leopoldstadt in search of dinner but our exploration of Vienna was abruptly terminated by a downpour. Fortunately Uber was available to rescue us and we were whisked to dinner at a Pan-Asian restaurant, after which we had a short walk home. 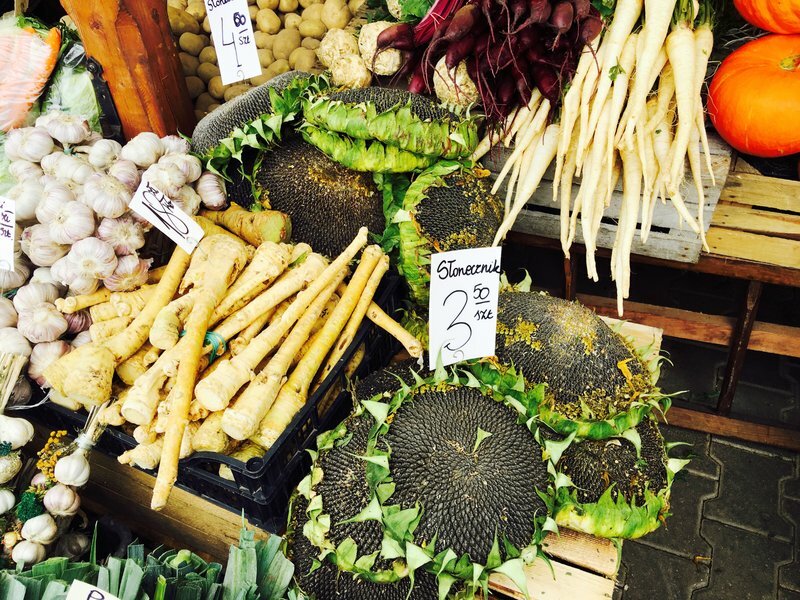 Monday morning we went straight to the Naschmarkt. 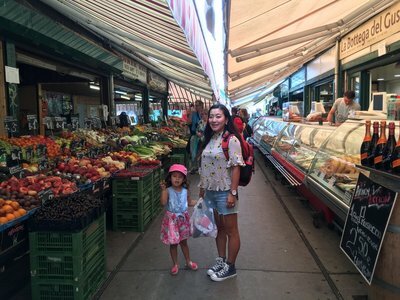 Some version of this kilometer-long market built over the Wien river has been in existence since the 16th century. 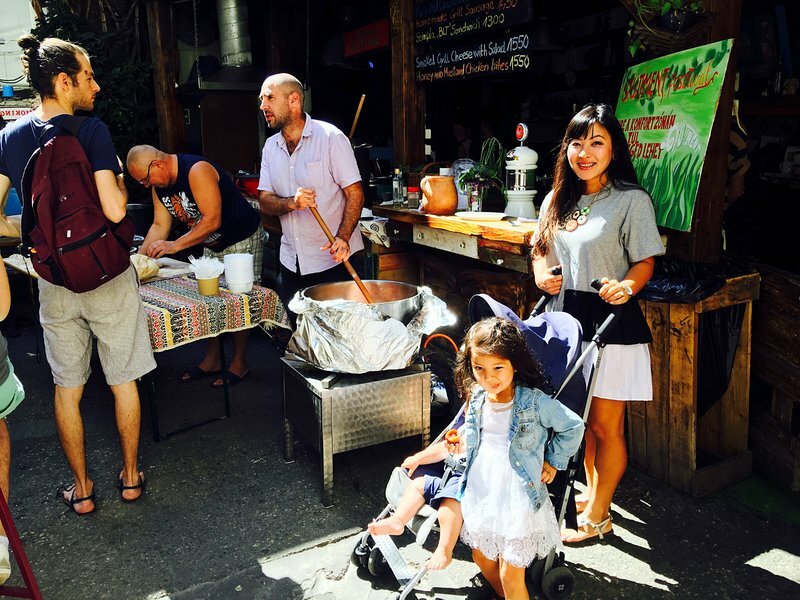 It's now a destination for gourmet and multicultural foods with an emphasis on Middle Eastern specialties. 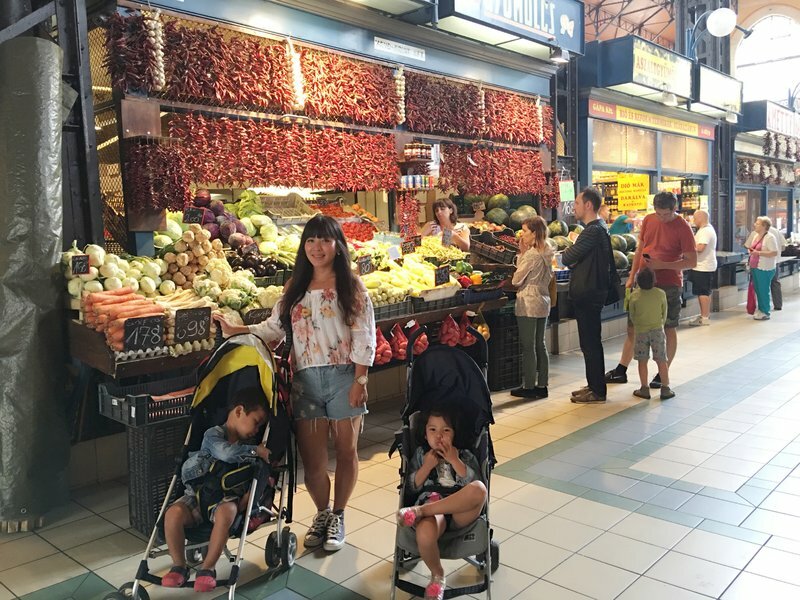 The produce is of good quality but expensive, likely due to the central location and the heavy tourist presence. There are also dozens of restaurants scattered along the length of the market. In some ways it was reminiscent of Munich's Viktualienmarkt. We had anticipated spending the whole morning there, but realized that there was a lot of repetition among the stalls and not a lot of goods we were willing to shell out for. 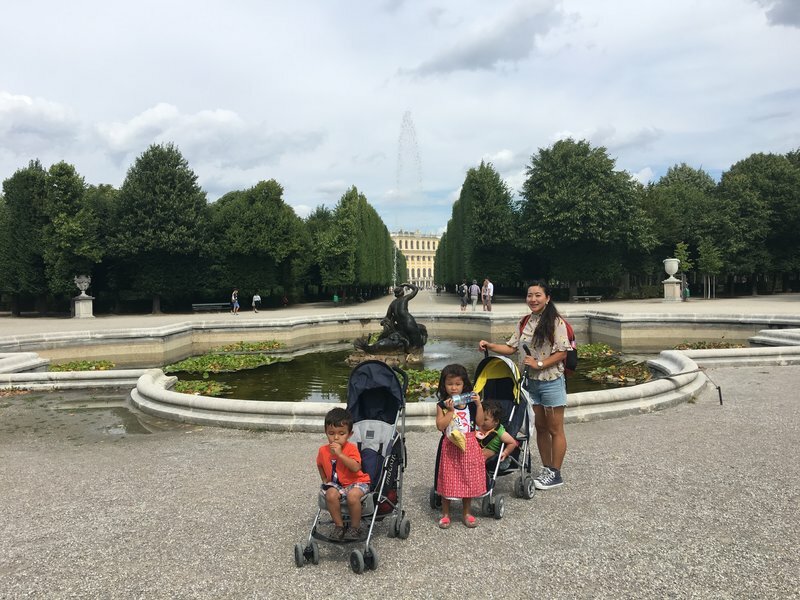 We dropped our purchases off at the apartment and drove to the enormous Schönbrunn Palace, where we walked around the manicured gardens and made an ill-fated attempt at visiting the famous Tiergarten Schönbrunn zoo. Ian was already asleep and Cleo threw a huge tantrum right after we paid the hefty entrance fee, following which she fell into a deep sleep herself. Rather than wander around the zoo for an hour waiting for somebody to wake up, we retreated to the car where we found our first parking ticket of the trip attached to the windshield. Annoyingly, there was no sign or paint on the curb where we had parked to indicate any kind of parking restriction. 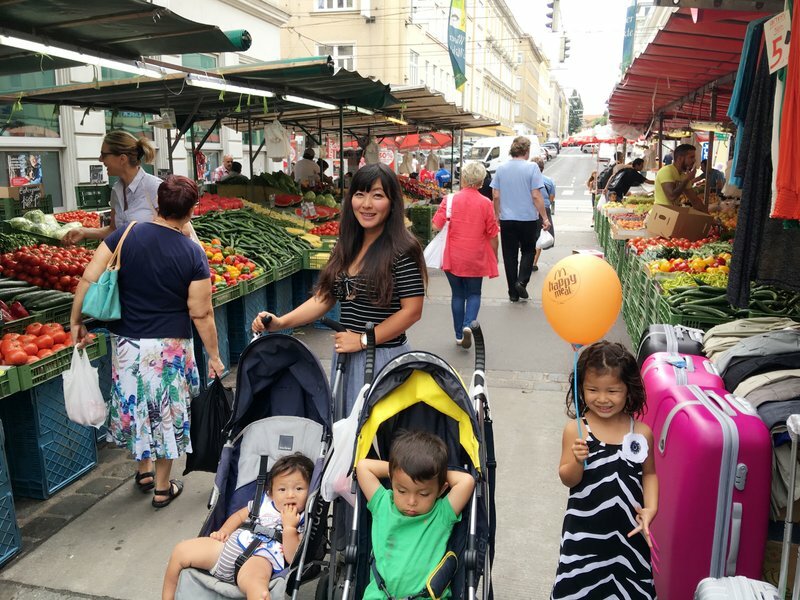 We decided to head back to Leopoldstadt, where we had been shut down by rain the previous day, for a neighborhood walk and dinner. 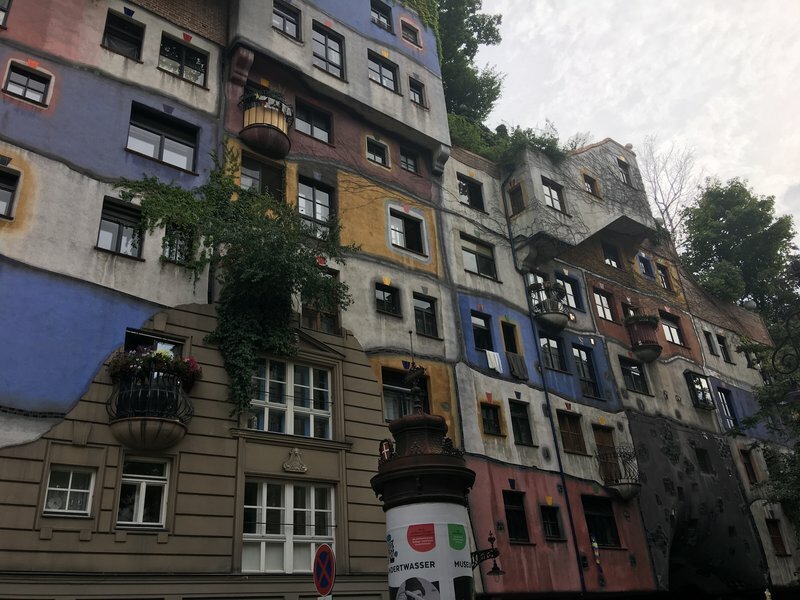 On the way we stopped at the colorful Hundertwasserhaus, an unusual residential building with an irregular, curvy facade and plant-covered roofs and balconies. In Leopoldstadt, I learned that parking in Vienna is authorized by purchase of a special card with a specific time allotment that has to be marked with the date and time and placed in the windshield. 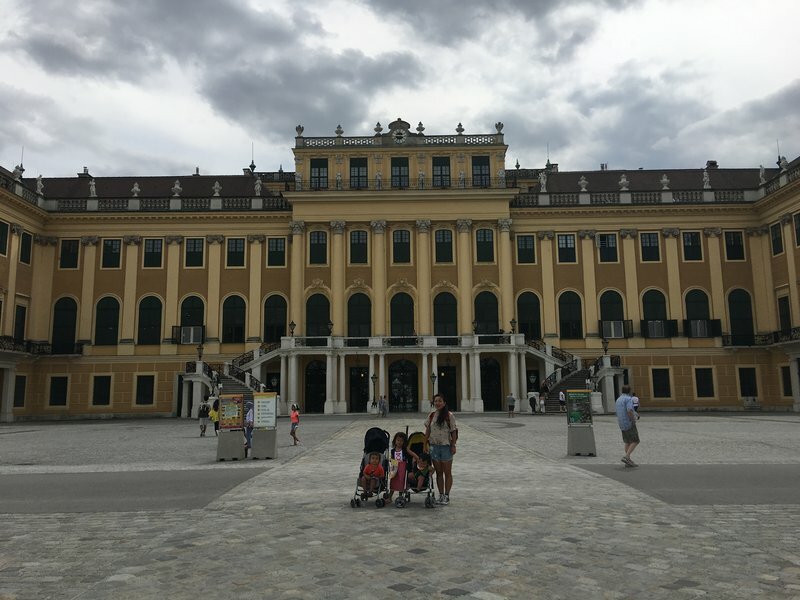 The lack of this card is what resulted in our ticketing at Schönbrunn. It's obviously very inconvenient to hunt around for a store that sells the cards every time one parks, so most people have a monthly sticker or something of the sort. I probably should have bought a few of the parking cards right away, but I didn't want to waste money on cards I wouldn't use. At the restaurant, Cleo and Ian found a friend to play with. Dinner was very typical pub food for the city. 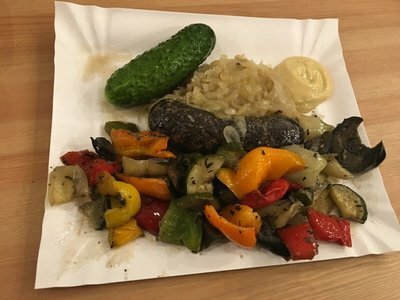 On Tuesday we went back to Leopoldstadt for the Karmeliter street market, but it was very limited so we just had lunch. 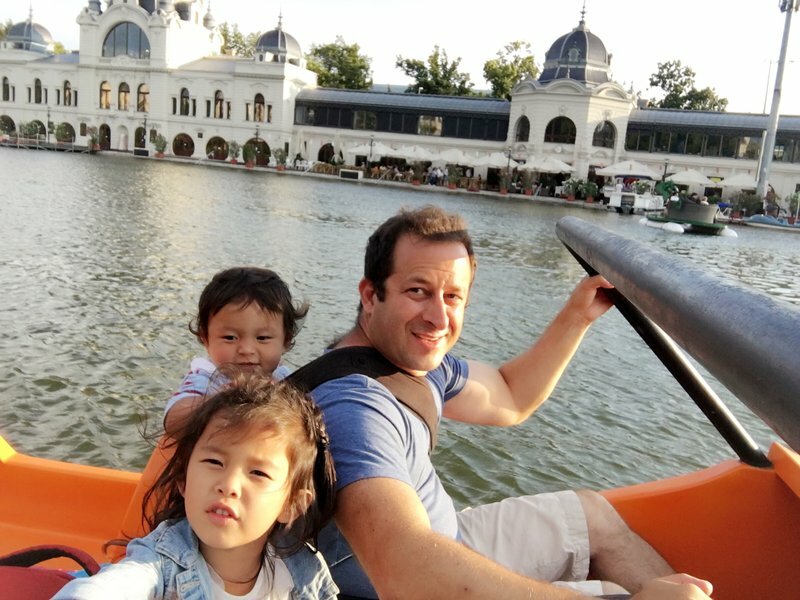 We decided to make it a fun day for the kids so we went to the amusement park at Volksprater in Leopoldstadt where we rode the train around the park and I took Cleo on the water flume. 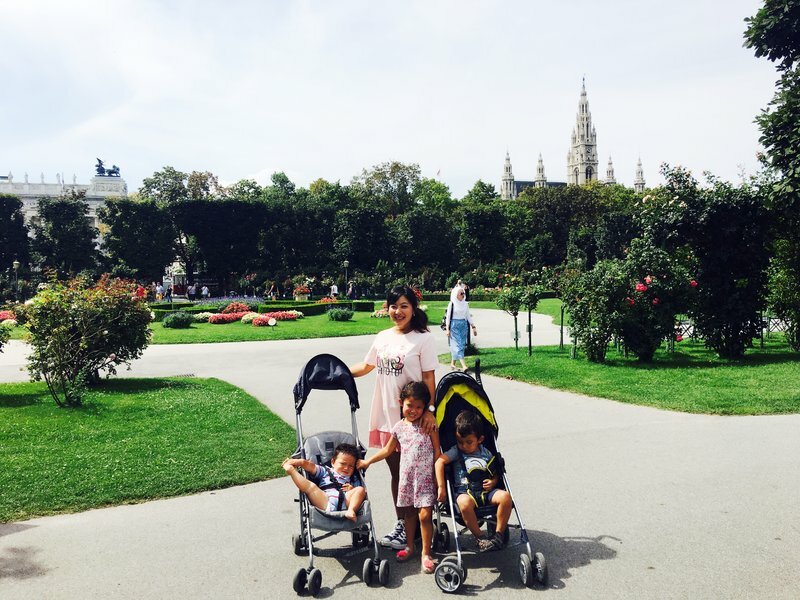 In the afternoon we took the kids to one of Vienna's famous outdoor pools on a tall hill at the outskirts of the city. Unfortunately trees and buildings blocked most of the view but the kids loved the two story slide into the pool. 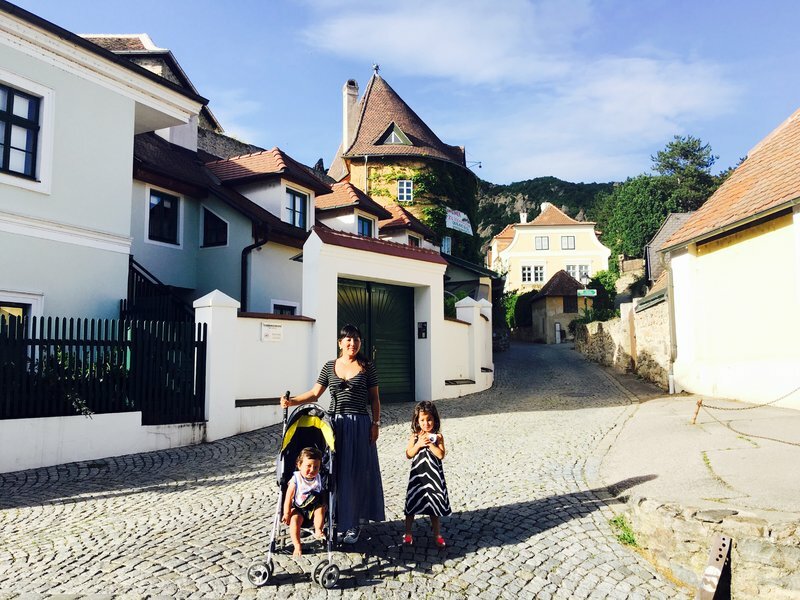 If I had planned better, we would have driven to the Wachau Valley on an earlier day in Vienna so that we could have arrived back home any time we liked. 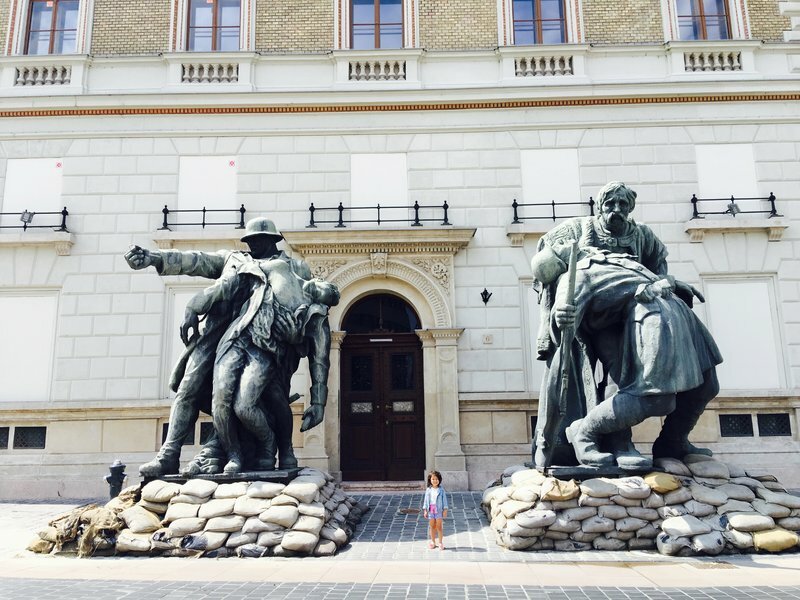 Since I left it for our departure day from Vienna, we had to rush in order not to arrive in Bratislava too late. In the morning we packed up and drove to the Brunnenmarkt in a more downscale area far to the east of the center. As it turned out we enjoyed this market more than the Naschmarkt as it was devoid of tourists and had a much more authentic and local vibe. Lunch turned out to be a lot better as well. 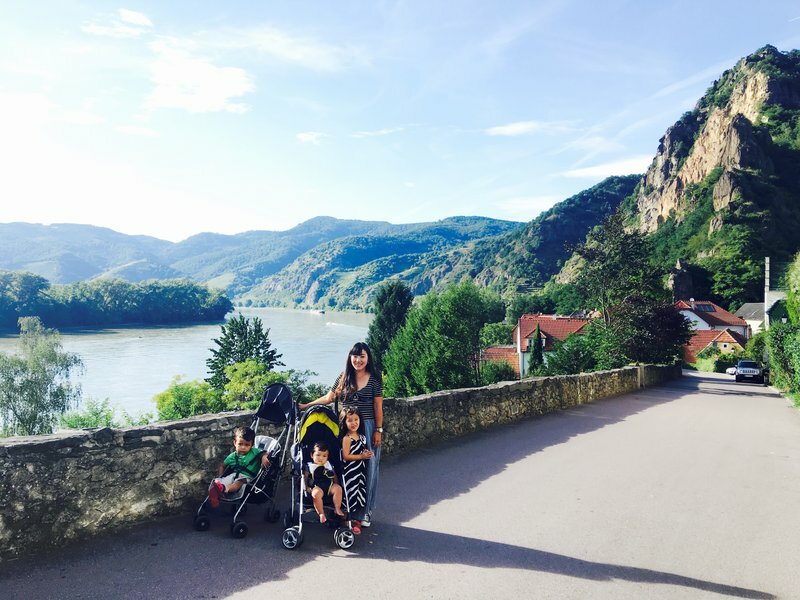 The Wachau Valley is a beautiful green area nestled in a curve of the meandering Danube, dotted with beautiful villages and vineyards. 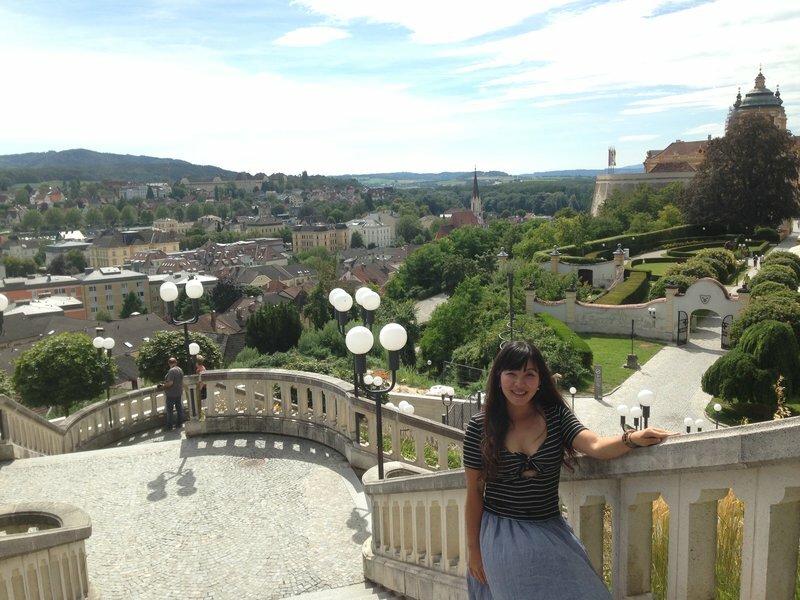 We chose to begin our afternoon in Melk, about an hour west of Vienna. 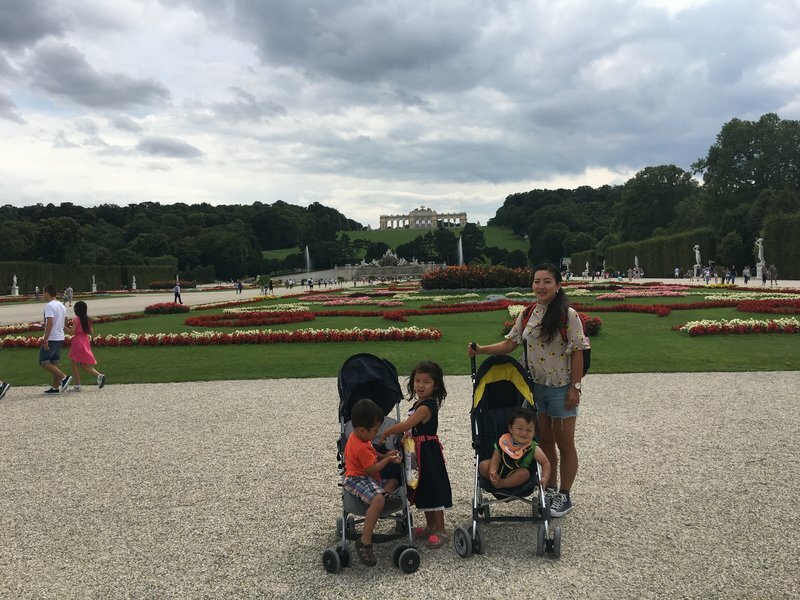 We had seen the Melk abbey atop its rocky cliff from the highway on our original approach into Vienna without knowing what we were seeing. Closer up it was a truly beautiful sight, a golden palace reminiscent in some ways of an Indian temple. As usual we chose to forgo the tour of the interior in favor of views from the abbey grounds. 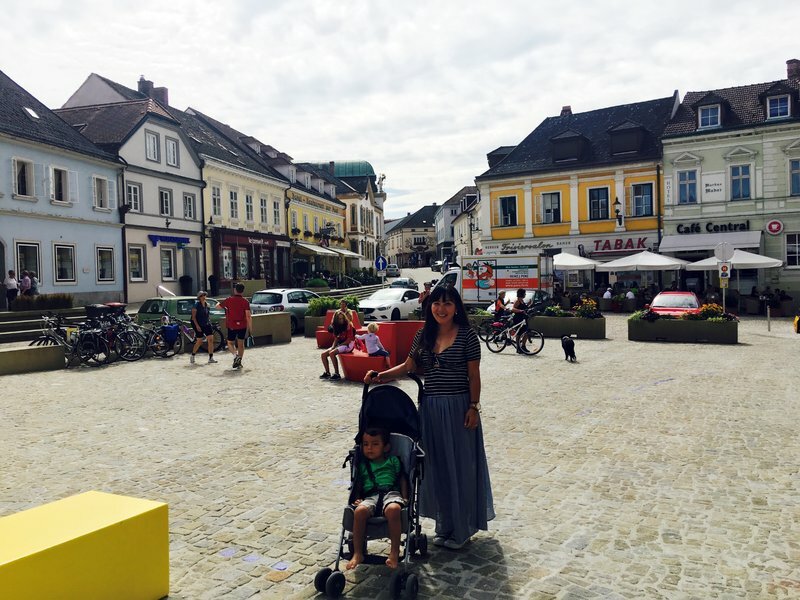 Melk village was an attractive place as well, although the old town only took ten minutes to explore. 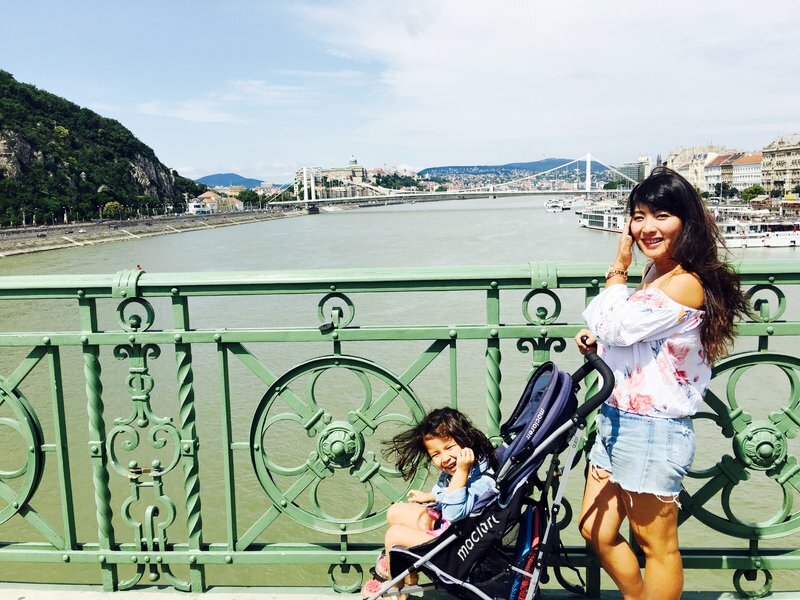 We walked across the tip of a peninsula formed by the Danube and one of its small tributaries to get a good view of the river right from its edge. 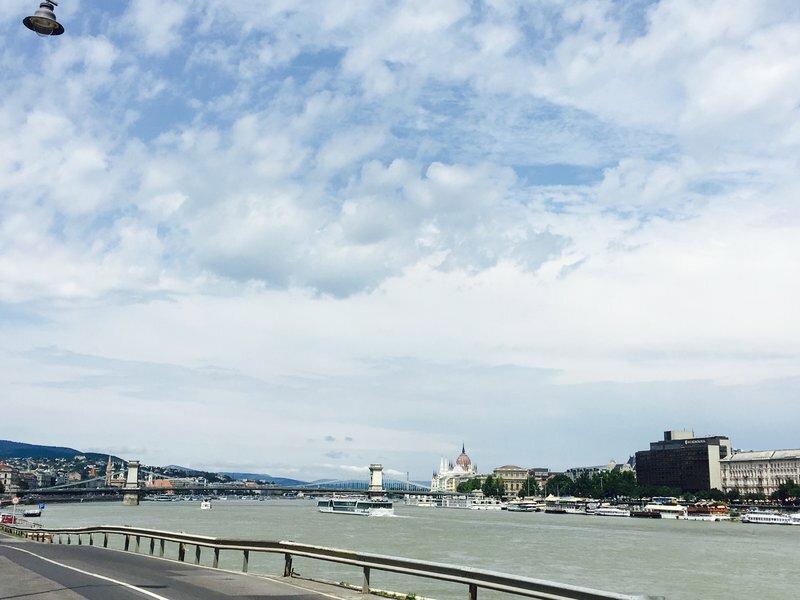 The road back west from Melk afforded a pleasant drive along the Danube with frequent sightings of boaters and bathers. 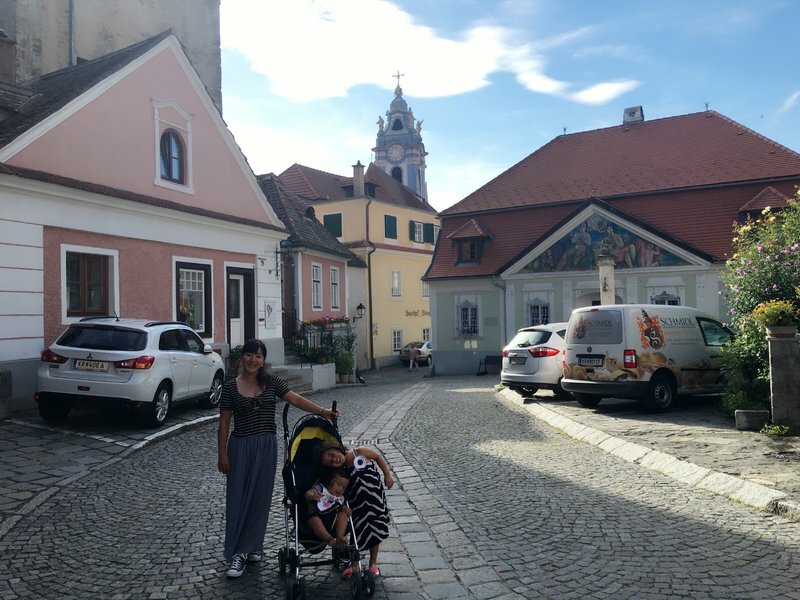 We only had time to stop in one more Wachau town and we chose Durnstein, a quaint and touristy one-road town that spills down a hillside to the edge of the river. We left the main road to do a little climbing on the pedestrian paths, but turned back well short of the castle ruins at the summit. The other major landmark of the town, the ornate blue spire of the abbey church, was tantalizingly close but the abbey was already closed when we arrived. We had to be content with outside views. 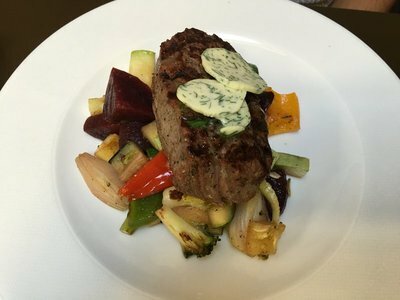 Instead of hanging around in Durnstein for dinner, we optimistically drove to the highly regarded Landhaus Bacher in nearby Mautern, hoping that an early arrival would rescue us from the consequences of not booking in advance. 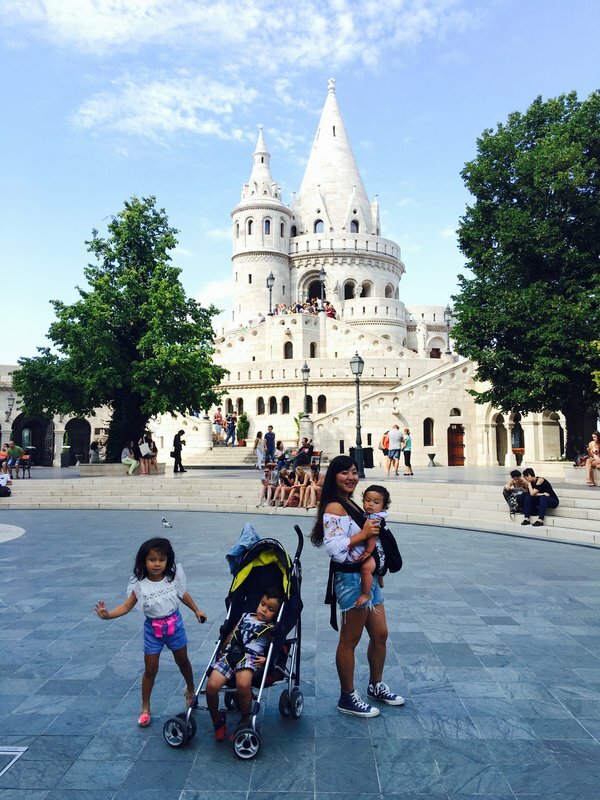 Unfortunately it was for naught as we were immediately dismissed, and we launched on another seemingly endless crusade for a TripAdvisor pick well away from the tourist path. Despite having called ahead for our table this time, and finding the restaurant half empty, we were kept standing around the entrance by a rather rude hostess for about fifteen minutes. Eventually I decided to stop preventing Cleo and Ian from running wild around the restaurant as long as we were kept waiting, and moments later a table was miraculously located. As I'd expected by that point, the food was average. Once we got back on the road, I still needed to buy a highway vignette for Slovakia. I started to pull over at service stations once we drew near to the border but when I asked for the vignette, the countermen would shake their heads and point further down the highway, uttering a German word I couldn't understand. Eventually we encountered the border, where there was a building but naturally no passport control as both Austria and Slovakia are within the Schengen area. I pulled over to see if there was someone I could ask about the vignette, and immediately saw that they were being sold at the office. Apparently the German word I didn't understand meant "border". Our Airbnb in Bratislava was in a labyrinthine apartment complex and was rather difficult to locate. By the time we'd wrangled the kids and bags up stairs, there wasn't anything to do except crash.